With hindsight, it was always going to be a logical step for Allied countries to say “au revoir” to Madame Guérin and her poppies, made by the widows and orphans in the devastated regions of France. All the countries recognised the benefit of the Poppy Days and Drives and how the collections helped swell the coffers of their respective Veterans’ organisations. One by one, each country put itself and its own returned veterans before France – they did not want to share the proceeds from poppy sales any longer. But Poppy Lady Madame Guérin needed to carry on because Northern France was still devastated. 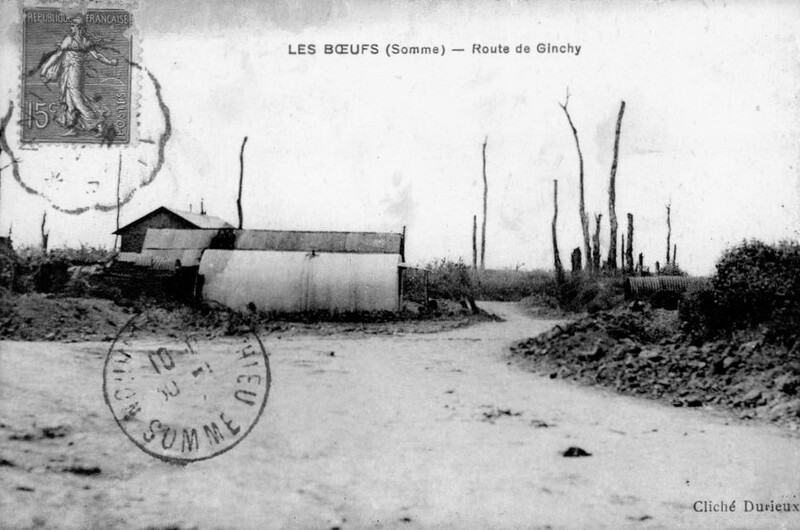 Les Boeufs, near Ginchy, Somme. France remained devastated. Courtesy of Heather Anne Johnson. 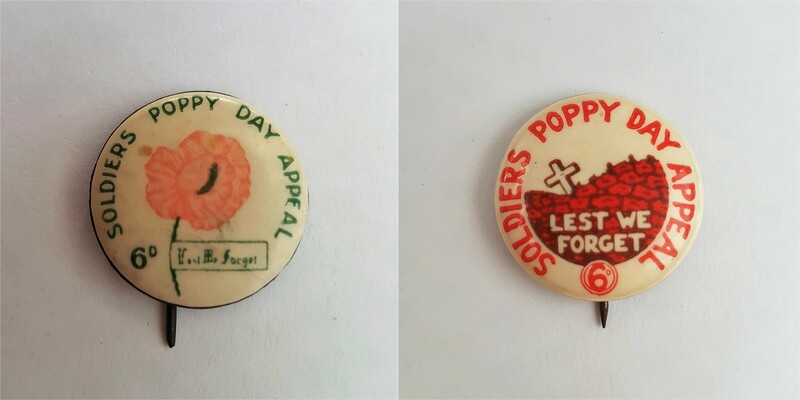 The May 1921 Memorial Day and nationwide Poppy Days/Drives conducted by Madame Guérin’s American-Franco Children’s League were over but the fight for the poppy in the USA was not. The American “au revoir” was the most complicated farewell of all the Allies. Frederick W. Galbraith Jr – Madame Guérin’s ally. 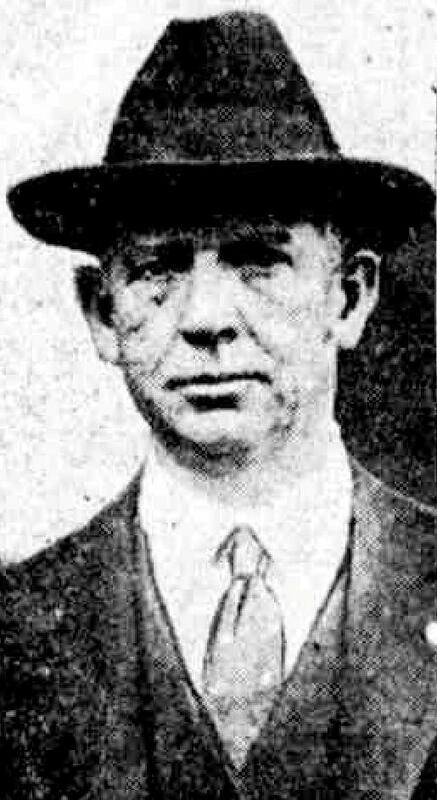 Image edited from Evening Public Ledger, 16 November 1920. 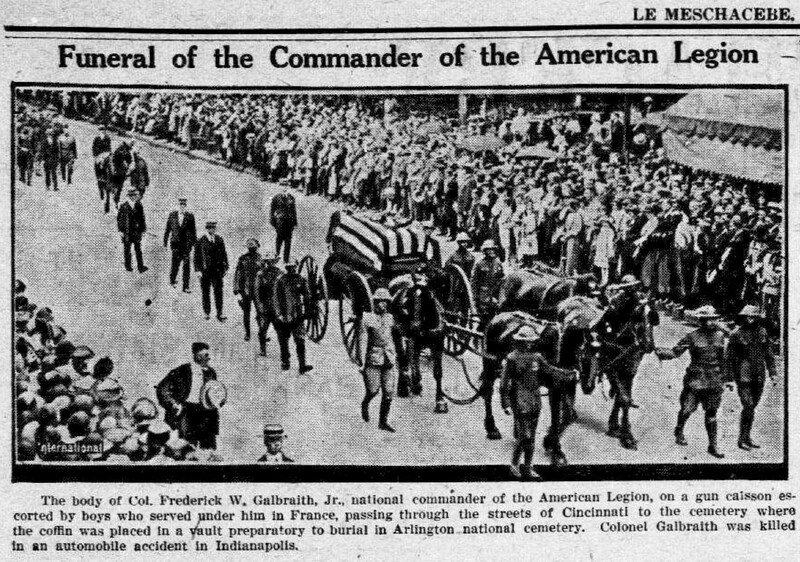 Colonel Galbraith’s body laid in state in the Great rotunda of the Cincinnati Music Hall on Saturday, 11 June – from 10 a. m. until the funeral service began there at 2 p. m. The casket was guarded by regular soldiers from Fort Thomas, Kentucky. Theodore Roosevelt (the assistant secretary of the navy), attended on behalf of the federal government. He was one of several VIP’s present and one of those giving an eulogy. His tribute to Colonel Galbraith was a moving one: “In his address Mr. Roosevelt said “In the great civic movements that have strengthened our cities, through the toil of every day life, on the shell torn battlefields of France – wherever service could be rendered, there you found Col. Galbraith, at the forefront of the battle, gallantly fighting for the right. The funeral cortège left the hall at approximately 3 p. m. and the service at the cemetery was reported as “brief”. “Taps” were sounded by a corps of buglers and a salute was fired by a squad from Fort Thomas. Funeral cortège of Madame Guérin’s Ally Colonel Frederick W. Galbraith, 12 June 1921. Le Meschacebe (Lucy, Louisiana): 02 July 1921. Amidst her 1921 campaign in Canada, Anna Guérin made a ‘flying visit’ to the USA. She had left Canada after meeting women of the Imperial Order Daughters of the Empire (I.O.D.E.) and the Great War Veterans’ Association (G.W.V.A.) Women’s Auxiliary on the 26th October in Winnipeg, to make her way to Missouri – to attend the 3rd American Legion convention. In her 1941 Synopsis Anna Guérin wrote this about that Convention [sic]: “I went to the National Convention of the American Legion , in Kansas , where I had been invited as Marechal Foch was to be there . In Kansas City THE AMERICAN LEGION AUXILIARY was formed and while the American Legion Auxiliary was adopting the Flanders ’ Poppy as Symbol , at the Convention of the American Legion they had repudiated it to take the DAISY .” This was the resolution referred to earlier, when Anna wrote about Colonel Frederick W. Galbraith’s death. Moina Michael may also have attended this convention or, at least, she appears to have been in Kansas City at the same time (?) – because Anna wrote a letter to Moina Michael (08 Feb. 1922), explaining she had tried Moina’s room “very often” but to no avail. “… The American Legion auxiliary did adopt the Poppy as Their Memorial Flower. So I asked to speak to their executive Committee to present to them the proposition as it had been adopted already by many Allied nations: “To help a little longer the poor women of the Northern part of France buy the poppies they will make 4 cents each and let us make next decoration Day a National Poppy Day with the help of all other patriotic organizations, each town keeping for their own relief work every theing [sic] they make above the cost price. And as this year the Poppies from France will be sold less than 10 cents, which will be a great profit to every local Charity Committee. And I said to them that their headquarters could sell the poppies throughout the country 4 cents 1/2 so they would have an annual source of resources for their Headquarters, quite legitimate, and which would allow them to carry on better their great work. On 08 November 1921, Moїna Michael wrote to Commandant MacNider of The American Legion – in relation to the Legion’s repudiation of the poppy as its memorial flower. Adjutant Lemuel Bolles replied in a letter dated 23 November: “My dear Miss Michael: I am acknowledging receipt of your letter of November 8th addressed to Commander MacNider, and concerning the adoption of the daisy as the official memorial flower of The American Legion for the reason that Mr. MacNider is with the Foch party on its western trip, and I do not know if he has had time to make you a personal reply. It has been found reported that Madame Guérin’s American-Franco Children’s League was dissolved “early in 1922”. However, this may be inaccurate because one of the League officers in France, Madame Lebon, has been found still communicating in her role, in November 1923. If the League did cease, Anna’s enthusiasm to encourage the Allied countries to continue with their poppy campaigns did not and she still wanted to make a difference. 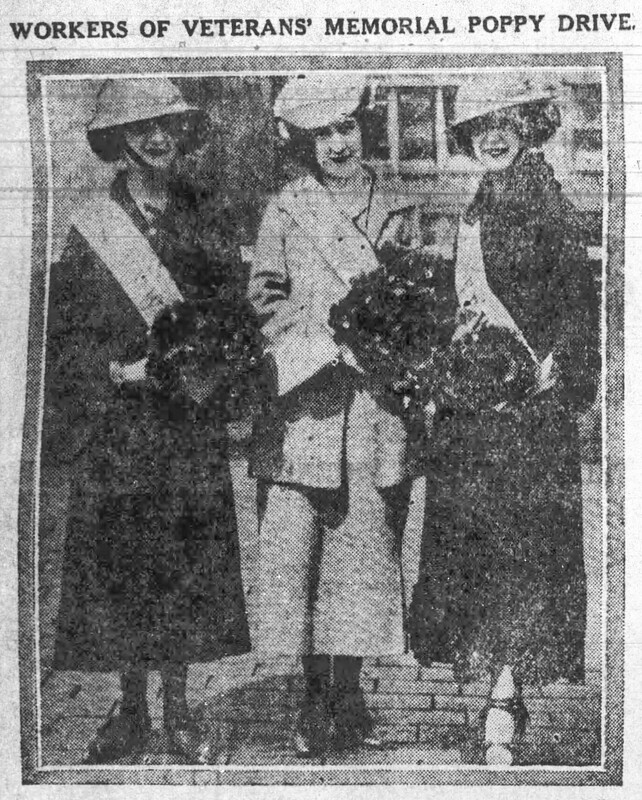 She would not have been daunted when the American Legion held a daisy drive in the State of Massachusetts – in February 1922. American Legion Daisy Day, 24 February 1922, in the State of Massachusetts. Courtesy of Heather Anne Johnson. So hearty has been the response of the public to the Daisy drive under the auspices of the American Legion for the benefit of the disabled veterans of the World war since it was started Friday noon that hundreds of people may be out of luck for their boutonnieres today. The big box of posies which arrived Friday is almost empty and the workers in charge have tried in vain to replenish their stock. After the American Legion disappointments, Anna Guérin still maintained her commitment to the widows and orphans in the devastated areas of France. She went to the ‘Veterans of Foreign Wars of the United States’ organisation instead. Ever faithful Isabelle Mack has been found described “regional director and organizer of the Veterans of Foreign Wars” during that 1922 poppy campaign. It is not known whether Isabelle had a connection with the V.F.W. before the campaign. “V.F.W. WILL HAVE CHARGE OF POPPY SALE IN AMERICA. The beautiful red poppy, seen in such abundance by thousands of American soldiers in the summer of 1918 along the road sides and in the fields of France, will be seen in equal abundance on Memorial day adorning the coats of men, women and children in America, if plans now being formulated by the Veterans of Foreign Wars of the United States for the sale of the flower materialize. Interallied Poppy day is now being observed in all of the allied countries, the idea having originated with Madame Guerin, who is known as the “poppy lady of France,” and has for its object the sale of the poppy as a means of raising funds for the assistance of disabled veterans of the war and the care of homeless children of France. The selection of the Veterans of Foreign Wars to handle the sale of the poppy in this country is in accordance with the custom of those in charge to name a similar organization in the allied countries for this work each year. As a result, local members of the V.F.W. are now making arrangements for the distribution of the flower in Phoenix and other cities in the state. They are being assisted by the Memorial auxiliary if the post together with the auxiliary of the American legion, which will have direct charge of the sales in the city on May 29. 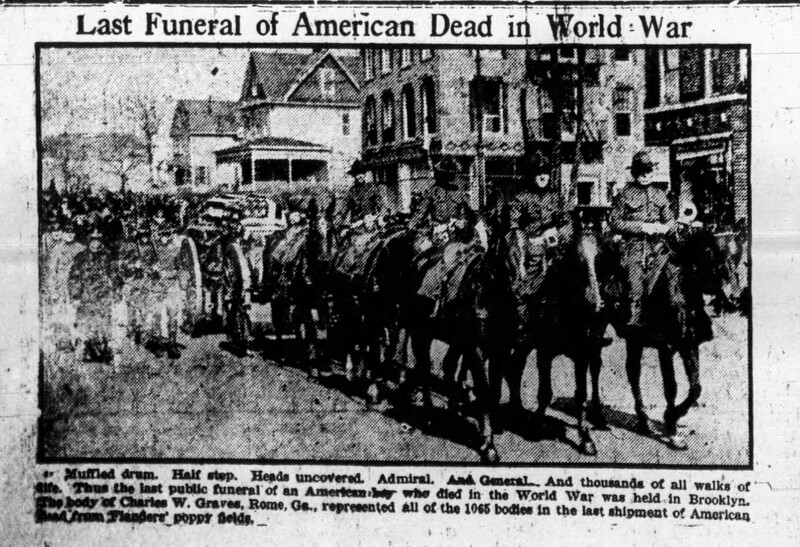 Last Funeral of American Dead in World War. 8 April 1922, The News Leader (of Staunton, Virginia). On 09 May 1922, the Pittston Gazette ran a short piece headed “WEAR FLANDERS POPPIES FOR HEROES OF ALL WARS. Buy and wear a poppy on Memorial Day, thus honouring our soldier dead by helping the living, in other words, help the boys who helped you. Such is the patriotic and practical purpose the Veterans of Foreign Wars have in view in arranging for the sale of the Flanders poppy to be worn on Memorial Day, not only memory of the soldier dead from the late world war, but also from all the wars in which our country has participated. On 11 May 1922, Anna’s friend Blanche Berneron addressed the Annual State Convention of the Veterans of Foreign Wars in Richmond, Indiana. 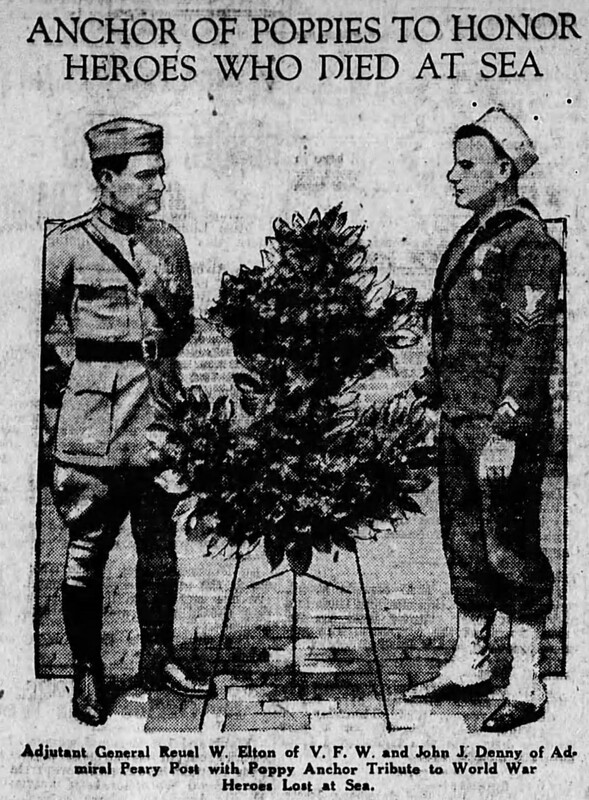 The next day, Indiana’s South Bend News-Times reproduced the speech Blanche had given: “It is as President Harding says in his letter “an appropriate way of testifying every remembrance and recognition, of the great obligation of the nation, to those who gave everything in the service, during the great war. “It also is such a beautiful sentiment. It is like a message coming from Flanders Fields, where 36,000 boys are still sleeping and warning us ‘not to forget’. They are the dead, but from their falling hands they have thrown us the torch. We shall hold it high. If we break faith with those who died, they could not sleep though poppies grow in Flanders Field. “Those poppies of red silk, replica of the real flower, are made by children, mostly orphans, crippled, disabled soldiers and particularly by all the needy on account of the war – they are made at the very places where the boys fought and won and where yet so many sleep. “The cost price of each poppy goes to France for the making and expenses of shipping and all the proceeds derived from Poppy Day are to remain here in America to help all relief funds of ex-servicemen. We shall in wearing the poppy honor the dead by helping the living. “The wearing of the Inter-Allied Poppy will link closer together the affection of the two countries – France and America, who were both ready to give until the last one for the same cause. The American Legion held Daisy Days during May. For example, Nebraska’s Alliance Herald (Box Butte County 23 May 1922) reported: “The Ellen Dodge legion Auxiliary will call May 27 and 29 Daisy Day this year. On these days the ladies will sell daisies at ten cents each. The proceeds from this sale will be used to buy the local post of the American Legion a flag. Daisy Day was called Poppy Day last year and red silk poppies in remembrance of Flanders’ Field poppies were sold. This year the Legion’s flower has been changed to the daisy for various reasons. It was discovered that several firms were commercializing the poppy for money reasons, and it was also discovered that the poppy spread so rapidly when planted that it was feared it might soon become an obnoxious weed instead of a rare and lovely flower full of memories for all who had relatives in the great world war. Madame Guérin may have left New York on 20 May 1922, on board the White Star Line ship ‘S.S. Majestic’ – bound for Cherbourg, France: accompanied by high-ranking members of the ‘Veterans of Foreign Wars’. The V.F.W. men were heading for Paris, to attend the Memorial Day ceremony – and Anna Guérin did attend this ceremony with them. However, she may have departed New York during the last week of March 1922: one “Anna Guerin” arrived in Southampton on 02 April, on the ship White Star Line ship ‘Homeric’. The lady was heading for the Hotel Victoria in London. 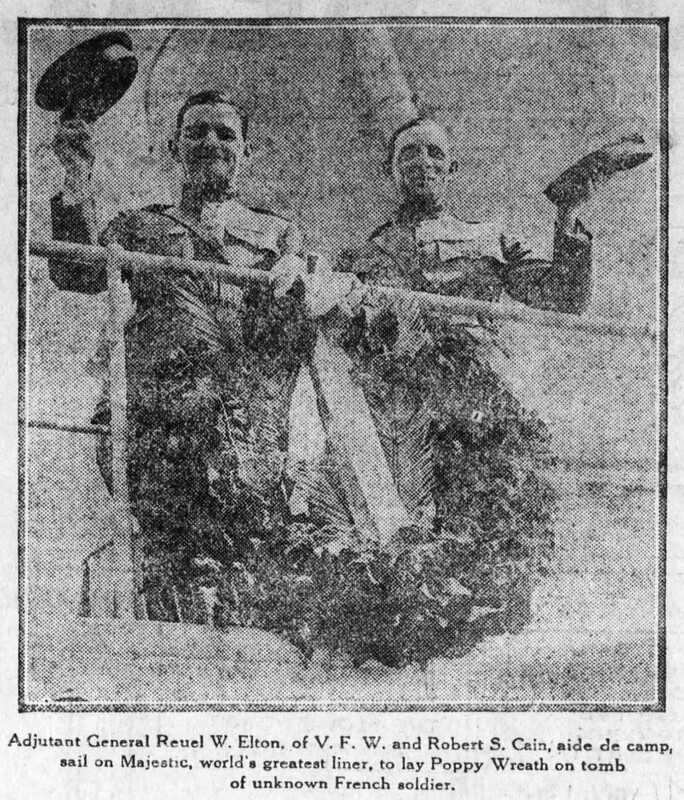 Veterans of Foreign Wars’ Adjutant General Reuel W. Elton & Robert S. Cain (aide de camp) about to set sail for France, on 20 May 1922. 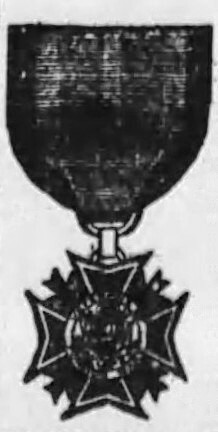 (New Castle Herald, New Castle, Penns., 26 May 1922). Various US newspapers enlightened their readers about that aforementioned visit to Paris at the end of May 1922. They all printed a photograph of the Veterans of Foreign Wars’ Adjutant General Reuel W, Elton and Robert S. Cain (aide de camp to V.F.W. Commander-in-Chief Robert G. Woodside), as they stood on deck, before sailing. Apparently, V.F.W. Commander-in-Chief Woodside was also on board. “AMERICAN VETERANS TO HONOR UNKNOWN POILU’S GRAVE. Adjutant General Reuel W. Elton, of the Veterans of Foreign Wars of the United States and Robert S. Cain, aide de camp to Robert G. Woodside, the Commander-in-Chief of the organization, sailed May 20th on the new giant liner, Majestic, to represent the United States Veteran bodies at a unique ceremony in Paris on Memorial Day,– the laying of a wreath of scarlet poppies as the tribute of America at the tomb of the Unknown “Poilu” at the Arc de Triomphe. The V.F.W. post in Paris, Benjamin Franklin Post, has charge of the Paris ceremonies, at which Marshal Foch, Ambassador Herrick, and representatives of the French and British military organizations will be present. Adjutant General Elton and his aide took with them the four-foot wreath of silken poppies which is to adorn the Unknown Poilu’s grave. The wreath is an exact replica of the wreaths which the Veterans of Foreign Wars will place at the tomb of the Unknown Soldier in the National Cemetery at Arlington and at the Soldiers and Sailors Monument on Riverside Drive. Scores of similar wreaths will be used by local posts of the V.F.W. at the Memorial Day services throughout the country. The V.F.W. delegation sails at the special invitation of the French veterans’ organizations, L’Union Nationale des Combattants, which will join in the Memorial Day service at Paris. Representatives of the French Legion, British Legion, American Legion, American Women’s Club, and Franco-American Children’s League will also attend the ceremony, a feature of which will be the insignia of the V.F.W. upon the Unknown Poilu and its acceptance by Marshal Foch on behalf of the French Government. On 21 May 1922, the Sacramento Union newspaper ran this very informative article ahead of the 1922 Poppy campaign [sic]: “V.F.W. NEWS: FLANDERS POPPY WEEK TO BE OBSERVED. Robert W. Service, “the Kipling of the North,” in his “Rhymes of a Red Cross Man” made light of the idea that a soldier might care for flowers. Perhaps he was right; yet the entire sentiment that was four years ago—has been crystalized into a single flower, the Flanders poppy. Those who put a shoulder to the wheel when the German military machine was rolled back across the devastated areas of France and Belgium will never forget the crimson battle token. Solemn is the word. Plain, unornamented crosses and on the arm a wreath of red flowers seeming to symbolize the blood the grave occupant had shed for humanity. That is why the men of the American Expeditionary Forces will always love the poppy. It was used as a floral tribute to their fallen comrades and, when the barrage ceased and the ragged line moved out, those who composed that line, invariably advanced through a field dotted with the frail flowers. Poppies, poppies everywhere, seeming to warn the soldier that death in all his grim, hideousness walked very near. Because of the sacrifices and glory which the flower represents in fighting men’s eyes it has been adopted as an inter-allied memorial flower and Poppy Day campaigns have been conducted throughout the allied nations. The campaign in America will be conducted by the Veterans of Foreign Wars of the United States, an organization composed of men who have seen battle service In the United States army, navy, marine corps in foreign lands and on foreign waters. The campaign is well under way. The American War Mothers are cooperating with the Veterans of Foreign Wars in the work. Of particular Interest is the announcement from national headquarters of the Veterans of Foreign Wars in Now York that the poppies to be used will come direct from France. They are perfect reproductions of the flower that decorates the American graves in Romange and are fashioned of silk by the women of the devasted area in France. The money paid for them by the Veterans of Foreign Wars is used in assiting the women who make them to rehabilitate themselves. The profit derived by the local posts of the Veterans of Foreign Wars will be used in veteran relief work. Very few realize the tremendous task thrust upon the veteran organization of America. They are attempting to care for those who have been wounded or otherwise incapacitated because of the war and the financial outlay necessary to maintain this service is almost unbelievable. Ever since the organization of the Veterans of Foreign Wars, 22 years ago, direct liaison with government pension bureaus, claims courts and the military departments has always been maintained and thousands of cases have been righted. That the government appreciates this service is proven by the praise of Colonel Forbes, director of the United States Veteran’s bureau. It is the most worthy work Imaginable but to be carried on funds must be obtained. Hence the Poppy Campaign. 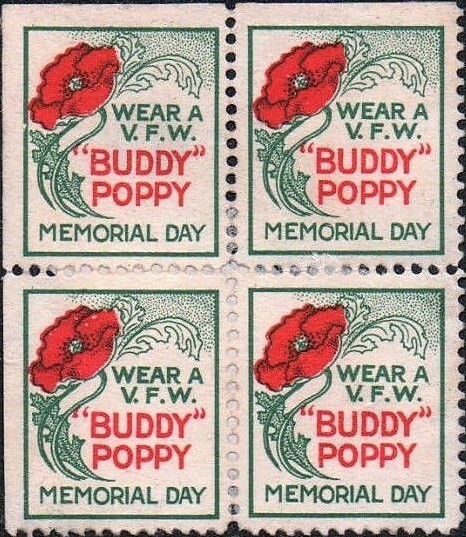 For a week prior to Memorial Day the Veterans of Foreign Wars will endeavor to sell poppies so that every man, woman and child will be wearing one of the Flanders hero symbols on Decoration Day. Plans for a Poppy Sunday will he made and every clergyman will be asked to devote at least three minutes of his sermonizing time to the poppy and the idea which made it an international memorial flower. The school children will be asked to aid as will every military, patriotic and civic organization. The funds realized are not to be used for a club house, or a new post flag or a piano, they will be expended in the Interests of disabled or needy former fighting men than which is no worthier cause. “I find myself heartly in sympathy with the purpose of the Veterans of Foreign Wars and the American War Mothers, in their request that the people at large shall wear on Memorial Day, a poppy, the inter-allied memorial flower. It is a moat appropriate mode of testifying our remembrance and recognition of the great obligation of the nation to those who gave everything In the service during the World War. BRIDGEPORT, Conn. John H. Williams, city treasurer and commander of department of Connecticut, V. F. W., is planning to have every person in Connecticut wear a poppy on Memorial Day. For a week prior to May 30 the V. F. W. will conduct a poppy campaign, the funds derived therefrom to be used In maintaining service bureaus for the use of former fighting men. Commander Williams’ department is one of the most active in this work. He has already arranged for a Poppy Sunday and will ask the school children to assist in the sale of the silk flowers which are made In France by the women of the devastated areas. BOSTON, Mass.—State commander John Mac Donald of the Department of Massachusetts, Veterans of Foreign Wars is personally directing the V. P. W. poppy campaign in his state. Commander Mac Donald Is very anxious to have every person in the state wear one of the battle tokens on Memorial Day. Poppy committees have already been formed in many cities and towns throughout Masschusetts. Poppy Lady Madame Guérin’s ‘Inter-Allied Poppy Day’ idea became a week. ‘Tampa Bay Times’, Florida. 30 May 1922. 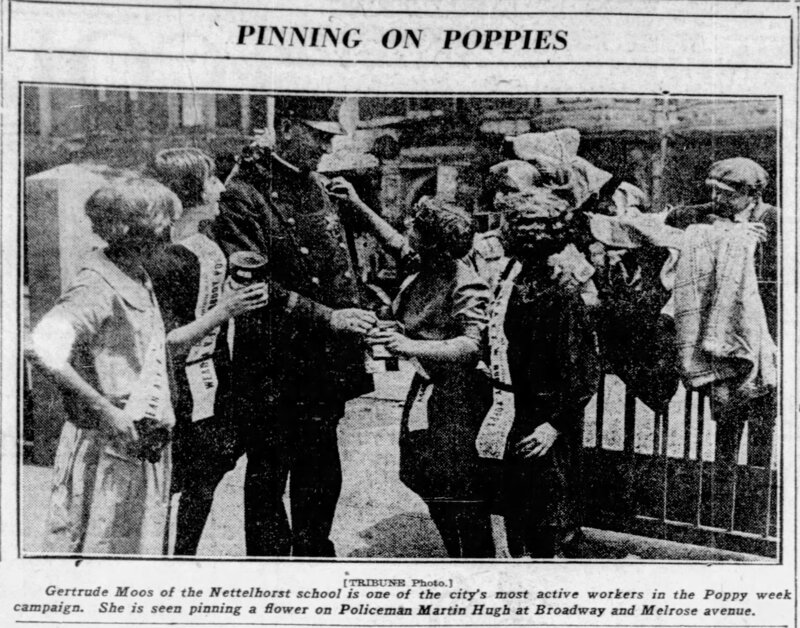 Poppy Lady Madame Guérin’s ‘Inter-Allied Poppy Day’ idea was a “week” in Tampa, Florida, in 1922 [sic]: “Inter-allied Poppy Week—May 22 to 29—will be celebrated in England, Canada, Australia, New Zealand and Cuba as well as the United States. President Harding has indorsed the suggestion that the people at large wear poppies on Memorial Day. The object of the celebration is to inaugurate a custom to cherish the memory of the dead in the world war. Veterans of Foreign Wars will conduct a sale of Flanders poppies, the funds derived to help the women of France and for local posts to meet unemployment conditions for the service bureau of the veterans’ organization.” (‘Tampa Bay Times’, Florida. 30 May 1922). The ‘Veterans of Foreign Wars’ was the first American veterans’ organisation to hold a National Poppy Drive in the United States. This was the second nationwide Drive in the USA, the first having been held/organised by the ‘American-Franco Children’s League’ on 28 May 1921. The V.F.W. decided to adopt the poppy as its own official memorial flower. “THE FLOWERS OF THE LEGION. American Daisy and French Poppy Official Posies of Both Branches of the Organization. There has been some confusion in the minds of Americans in general as to the status of the daisy and the poppy in connection with the American Legion and the American Legion Auxiliary. The daisy is the Legion’s official flower; the poppy is the Auxiliary’s memorial flower. The misunderstanding arose in the first place, because in its early days the Legion did adopt the poppy of France as its flower. But at its Kansas City convention the American Legion adopted the daisy as its official flower on the grounds that the daisy is an American flower and the poppy of Flanders is available for use only in artificial form. 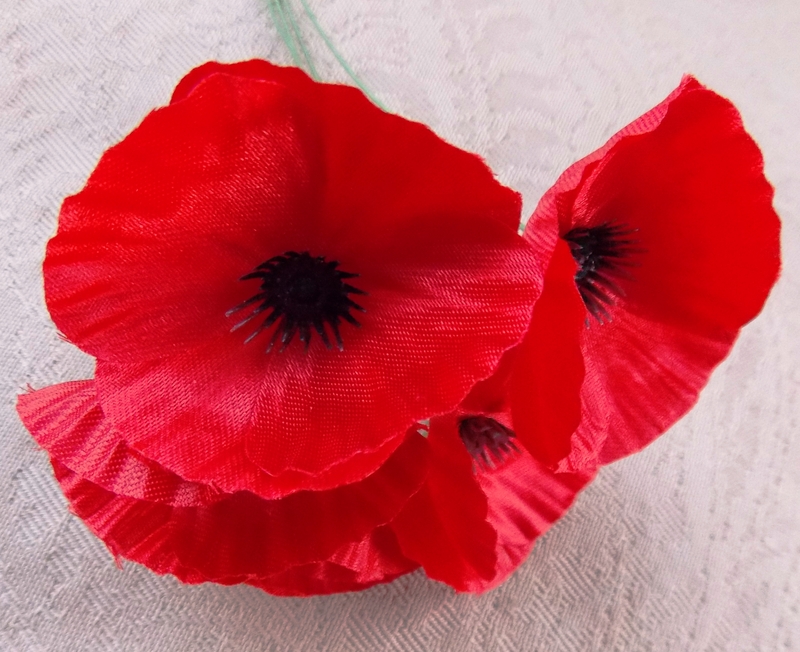 The Legion Auxiliary has taken advantage of the very fact that the poppy is not available as a real flower to buy artificial flowers made by disabled soldiers in hospitals. The Massachusetts Legion and Auxiliary netted something over $46,000 from the sale of artificial poppies last winter. This money was used to better the conditions of sick and needy veterans of the World war. The American Legion made a U-turn and adopted the poppy as its official flower again at its convention in October 1922 – in line with its Auxiliary. French women and children making poppies in France. The Tampa Tribune (of Tampa, Florida), 20 May 1923. 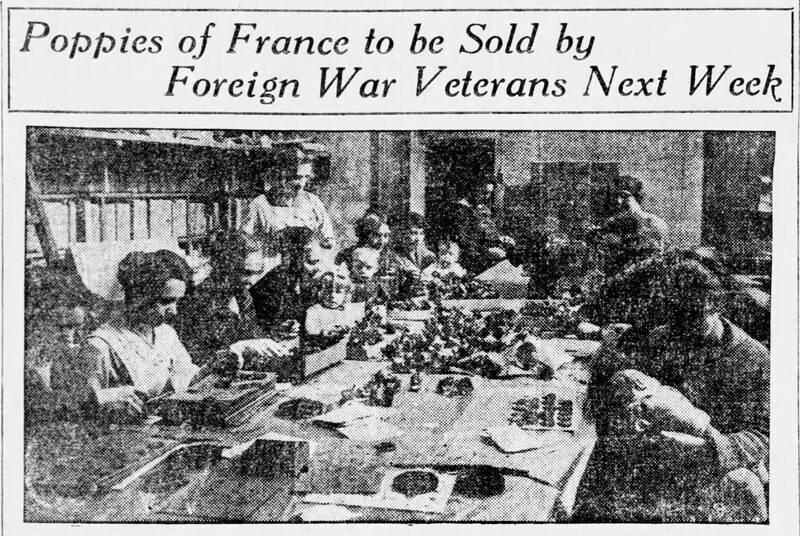 In the same Tampa Tribune edition as the above photograph (20 May 1923), an article wrote about the local American Legion Post getting French-made poppies [sic]: “Legion Post Poppy Sale To Be Held Saturday; Get 12,000 From France. Sale of poppies by the American Legion, U. S. S. Tampa Post No. 5, will be conducted next Saturday, the day preceding the Legion’s annual Memorial Day services, it has been announced by J. C. Huskisson, chairman of poppy day arrangements. The Legion has secured 12,000 poppies from national headquarters and hope to sell all of them. Purchasers are requested to wear their poppies on Memorial Day, in memory of those who died in the World War. This sale of poppies, the Legion national flower, is an annual event with Legion posts throughout the country. The greater portion of the proceeds here will o into the post fund for relief of disabled veterans of Hillsborough country, or for needy veterans and their families. Part of the proceeds will be turned into the National American Legion overseas endownment fund, to insure perpetual care of the 32,000 American soldiers graves in Europe. The national organization is endeavoring to raise a fund of at least $1000,000, or $200,000 if possible, the income of which will be used to care for and decorate the graves in Europe. The American flag is still in Europe, floating over six cemeteries in France, one in Belgium and one in England. V.F.W. Poppy Anchor : V.F.W. Adjutant General Roual W. Elton and John J. Denny of the Admiral Peary Post. The Eugene Guard, Oregon. 25 May 1923. WORKERS OF VETERANS’ MEMORIAL POPPY DRIVE. The Anaconda Standard, 27 May 1923. 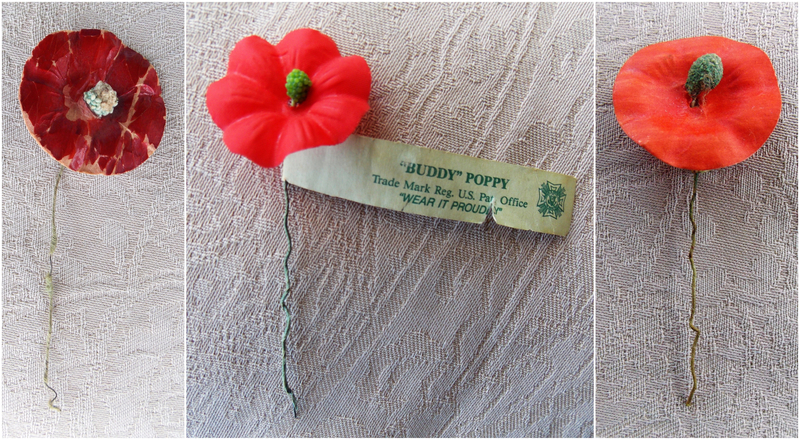 In February 1924, the Veterans of Foreign Wars registered the name “Buddy Poppy” with the U. S. Patent Office and it is their Buddy Poppies which are distributed throughout the U.S.A. today. The days of the French-made poppies for the V.F.W. were over but not the loyalty that the organisation continued to show for Madame Guérin – as the originator of the “Poppy Day”. 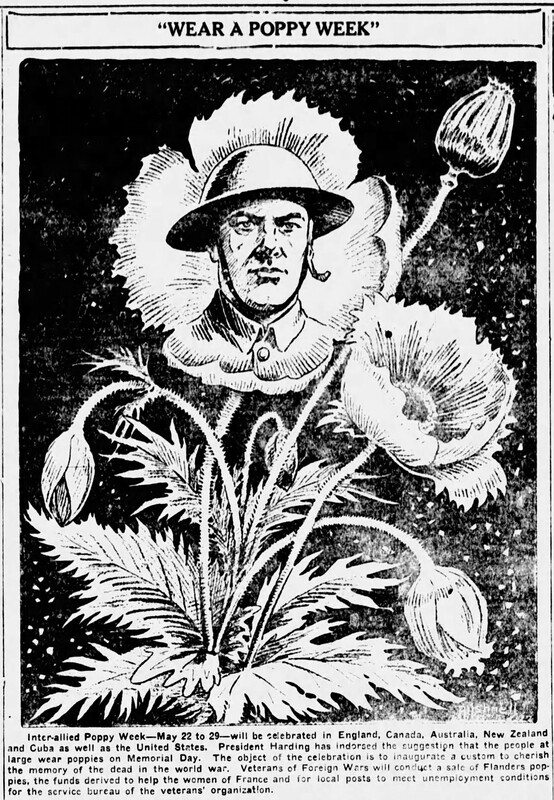 “Pinning on Poppies” – The Chicago Tribune, 28 May 1924. Again, the Poppy Girls were wearing sashes – a hallmark insignia that Madame Guérin made popular with her early Poppy Days … e.g. “… girls were out arrayed in pleasant smiles and sashes …” in Park City, Utah, 24 April 1920. Keeping with the ‘Veterans of Foreign Wars’, the photograph below depicts two American V.F.W. ex-service men, who were probably involved in discussions and decisions about the ground-rules for the V.F.W. 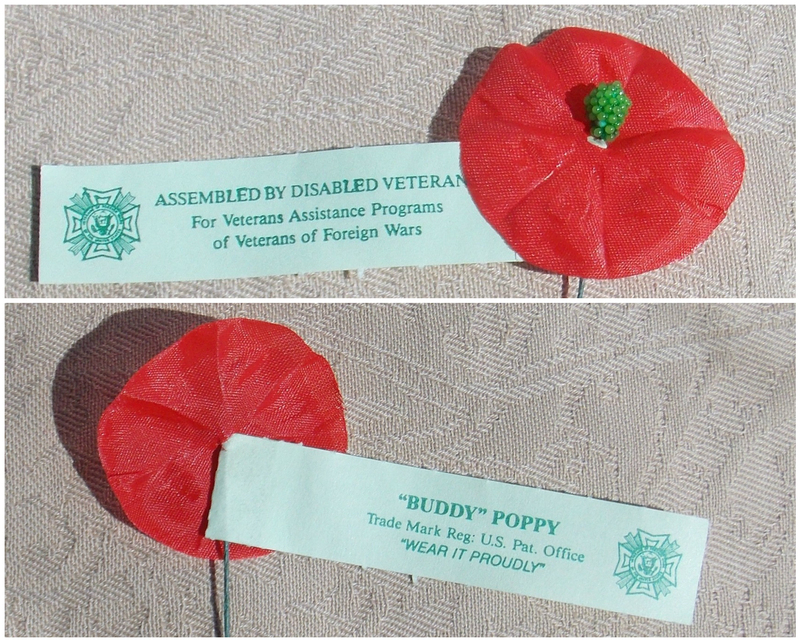 “Buddy Poppy” – which took place at the V.F.W. National Convention on 08 September 1924. A Pennyslvanian newspaper article (transcribed below) described the men as “prominent in the affairs of the Veterans of Foreign wars”. They have been identified as Sergt. Bill Kahler and John W. Brown. American ex-service men, heading to Veteran of Foreign Wars’ Convention on 08 September 1924. Courtesy of Heather Anne Johnson. Hand written on the photo’s back is: “Adjutant Alex Berger Sergeant Bill Kahler” “Liason Atlantic City Los Angeles” “To national convention Veterans of Foreign Wars”. Based on the uniform and stripes, it is believed that Adjutant Sergt. Kahler is the veteran standing on the left and Junior Vice-Commander Pvt. John W. Brown is on the right. ‘The Scranton Republican’, Scranton, Pennyslvania, on 16 August 1924, page 3 [sic]:- “CALIFORNIA V.F.W. MEN HERE ON VISIT. 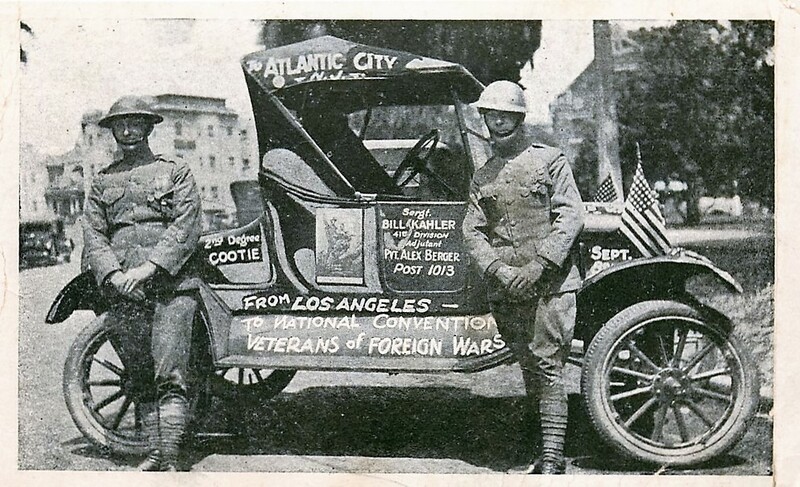 Two ex-service men, who are prominent in the affairs of the Veterans of Foreign wars, arrived in this city yesterday from Binghamton on the last lap of their motor trip to Atlantic City where they will attend the national V. F. W. convention next month. The veterans, John W. Brown, junior vice-commander of Alex Berger post, No. 1013, and William Kahler, adjutant of the same post, both of Los Angles. Cal., are the guests of the local V. F. W. post. Given all the information gleaned, it is believed that The Scranton Republican bears the most accurate facts. The photograph was either taken in Los Angeles, before they left, or on their arrival in Atlantic City. V.F.W. Post 1013 was formed in early 1923. A Post cannot be named after a living person and, it is believed, this Post was originally named in honour of US Marine Private Alexander Tindolph Berger, who had been killed in France on 19 July 1918. Information on Messrs. Berger, Brown and Kahler will be shared here at a future date. In 2015, Post 1013 changed its name from to that of ‘Cpl Guy Gabaldon Post’. With the shifting sands of time, Post 1013 has honoured a more recent veteran – Corporal Guy Gabaldon (1926-2006). Guy Gabaldon was a US Marine – a local lad decorated for his service during the Second World War battles for the Saipan and Tinian islands in 1944. His war-time actions inspired the film ‘Hell to Eternity’. This has been another digression from the story of Poppy Lady Madame Guérin but it is considered worth while sharing. American veterans had begun making poppies but, certainly in those early days, they could not meet the demand. Take the American Legion … it still had to call upon their Auxiliary women to volunteer to make extra poppies. Additionally, the Legion had to out-source: “… Unfortunately, not all of the poppies sold in the United States are made by disabled veterans. Last year over 3,000,000 poppies were made by disabled veterans for the Auxiliary’s National Poppy Committee. But over 3,000,000 poppies were made in factories — “commercial poppies” they call them, in contrast with the poppies the veterans make. Poppy-making and poppy-selling make up an endless chain of help for the disabled men in hospitals. The profits from Auxiliary poppy sales finance new purchases from the men who make the poppies at their bedside. …” (American Legion Weekly, Vol. 8, No. 14, 02 April 1926). 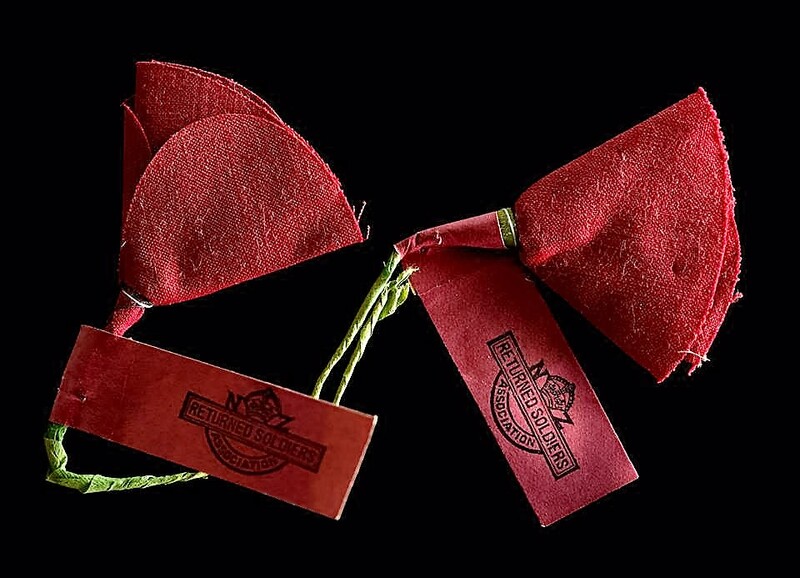 The Veterans of Foreign Wars’ patented ‘Buddy Poppy’. Courtesy of Heather Anne Johnson. 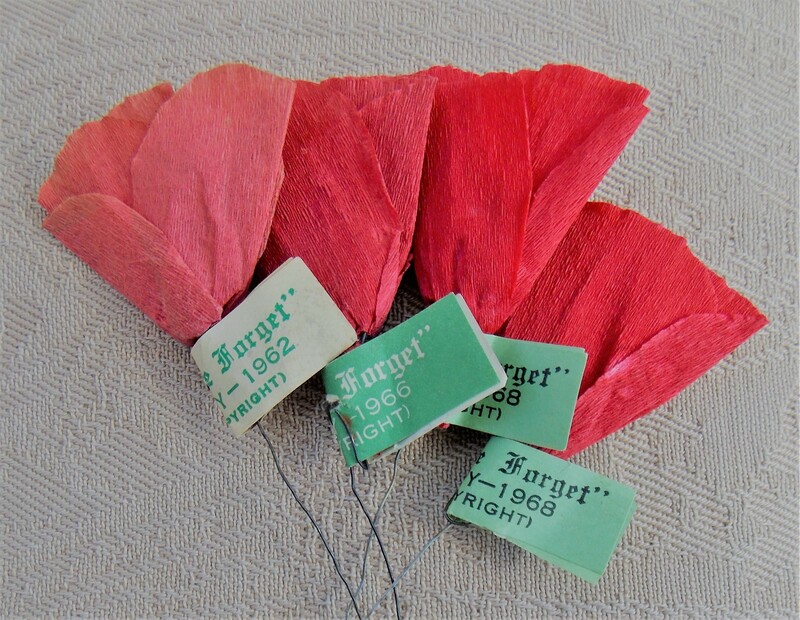 The State of Pennsylvania’s American Legion (and its Auxiliary) produced a particular type of tagged Remembrance Poppy, shown below, during the years 1927 and 1934. If the design did not change during that period, this particular poppy could have been produced during any one of those eight years. The Pennsylvanian American Legion tags read: “IN MEMORIAM. 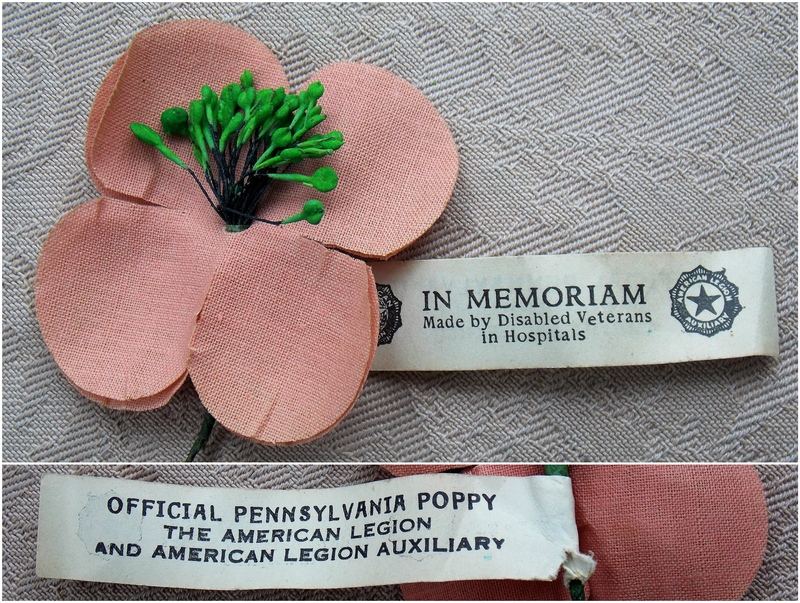 Made by Disabled Veterans In Hospitals”, on one side; and “OFFICIAL PENNSYLVANIA POPPY THE AMERICAN LEGION AND AMERICAN LEGION AUXILIARY”, on the other. A Pennsylvanian American Legion Remembrance Poppy. c1927-1934. Courtesy/© Heather Anne Johnson. This American Legion’s poppy design and construction is reminiscent of the Poppy Lady Madame Guérin’s French-made poppy that graced the streets of Great Britain in 1921. It is deduced (without evidence to the contrary) that poppies supplied to the U.S.A. by Madame Guérin, at some point (perhaps every year she supplied them? ), were in this style and the Pennsylvanian American Legion used Madame Guérin’s poppy as a template for their emblem. 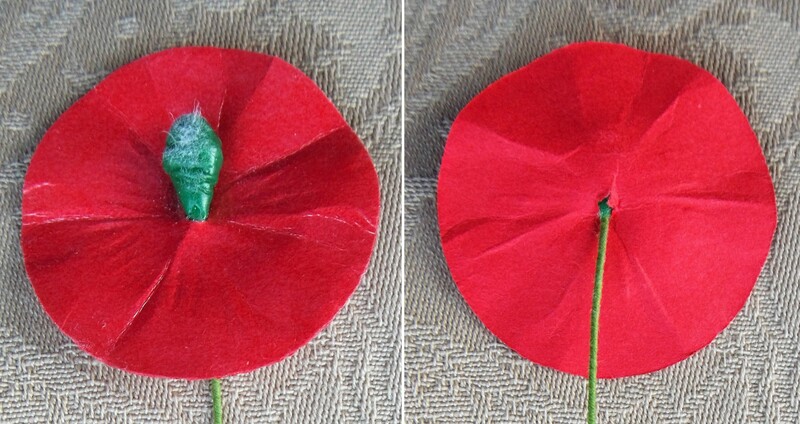 The two poppy styles are identical in size and shape, but the American-made poppy has two layers of fabric against the Guérin version; the American poppy has more stamens; and both have a tag. Interestingly, a 1921 Guérin poppy held by the British poppy charity ‘Poppyscotland’ is pink just like the American Legion one. The colour is the same on both sides of the fabric, which suggests a scientific reason for the dye colour deterioration of the once-red vintage poppies – rather than sun-light. “LEGION AUXILIARY MAKING PLANS FOR ANNUAL POPPY SALE. Memorial Flowers to be Offered This Year Have Been Made by Invalided Soldiers in Hospitals. The American Legion Auxiliary has completed all plans to launch its annual poppy sale during the coming week. The ladies have left nothing undone to make this the most successful sale ever held by the local unit. The American Legion and Auxiliary have inaugurated a new industry in the veterans’ hospitals in Pennsylvania this year. Our men in this state assisted by the Auxiliary of the American Legion department of Pennsylvania, have made all the poppies to be sold in this state. The annual opportunity to the public to wear a memorial flower for the beloved service men who gave their lives in the World war and provide a means to add to funds spent for welfare work among the needy veterans of today, will have an added appeal this year, as the poppies are Pennsylvania’s own product. The bulk of the poppies have been made at hospital No. 49 and the Marine hospitals in Philadephia and Pittsburgh assisted by the auxiliary units throughout the state. The local unit has made about one half of the poppies to be placed on sale in Shamokin. 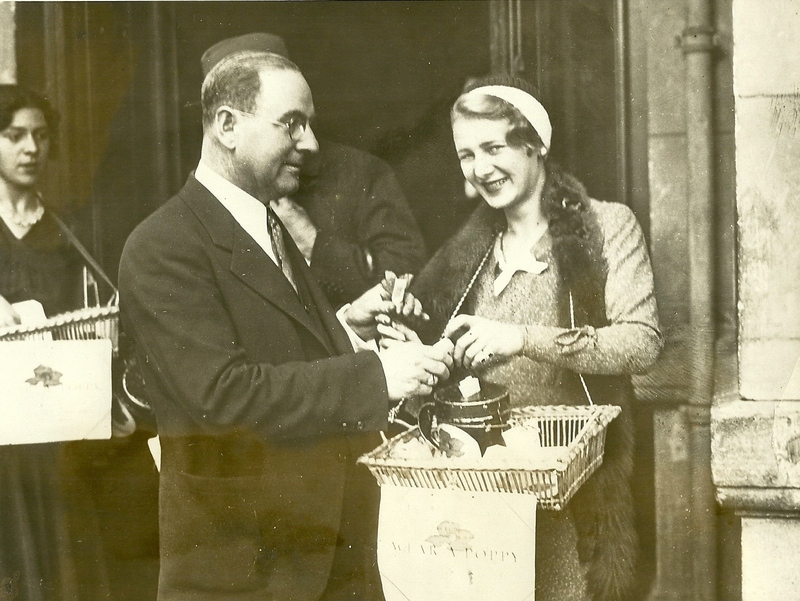 The management of the Victoria and Capitol theatres have very generously consented to show the auxiliary poppy film showing the ex-service man at work on the poppies and the ladies will be on hand in the lobbies of the theatres and on the streets, with the finished product, and appeal to the public to co-operate in this worthy cause. “VETERANS MAKING POPPIES FOR NATIONWIDE SALE. The above shows Edwin E. Hollenback, State Commander of The American Legion, Department of Pennsylvania, and Mrs. Frederick P. Moore, State President of The American Legion Auxiliary, inspecting poppies made by disabled veterans in a Veterans’ hospital in Pennsylvania. It was announced today by State Headquarters in Philadelphia that the posts and units in Pennsylvania have made application for 1,350,000 poppies. State Commander Hollenback said today that poppies are made by men not receiving compensation from the Government and that the profits made my the posts and units would be used for Child Welfare and the care of the disabled and their families. Research by the author unearthed the facts that ‘Acme News Pictures’ no longer exists; its archives were purchased by ‘Corbis Images’; ‘Corbis Images’ was sold to the ‘Visual China Group’; and VCG has granted ‘Getty Images’ a licence for the images. A search, at the author’s instigation, has not located this photograph within archives and, as owner of this particular photographic print, I am displaying it. Heather Anne Johnson. 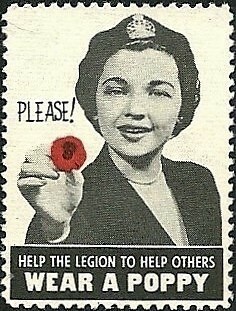 American Legion Auxiliary Poppy Day Stamp. 1948. This image shown above is of an American Legion Auxiliary Poppy Day stamp. It appears it can be described as a ‘Cinderella’ stamp … one that, to all intents and purposes, looks like a postage stamp but was never valid for postal services. It may also be defined as a ‘Poster Stamp’ … given that it is delivering a promotional message – in this instance, for Poppy Day. The ‘stamp’ measures 1 1/8 inch wide and 1 3/4 inch long. 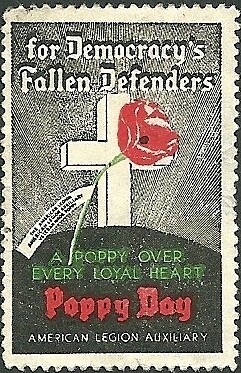 The stamp contains the following text: “for Democracy’s Fallen Defenders”; “A POPPY OVER EVERY LOYAL HEART”; “Poppy Day”; with the words “THE AMERICAN LEGION. AMERICAN LEGION AUXILIARY. VETERAN MADE POPPY” appearing on the tag shown in image. U.S. Veterans of Foreign Wars ‘Cinderella’ stamps. c1935. “WEAR A V.F.W. “BUDDY” POPPY MEMORIAL DAY”. American Legion 2016 Poppy tag/pin, distributed in Las Vegas. Courtesy of Heather Anne Johnson. ‘The Jewish War Veterans of the U.S.A. and National Ladies Auxiliary’ White Poppy. Post-1928. Courtesy/© of Heather Anne Johnson. 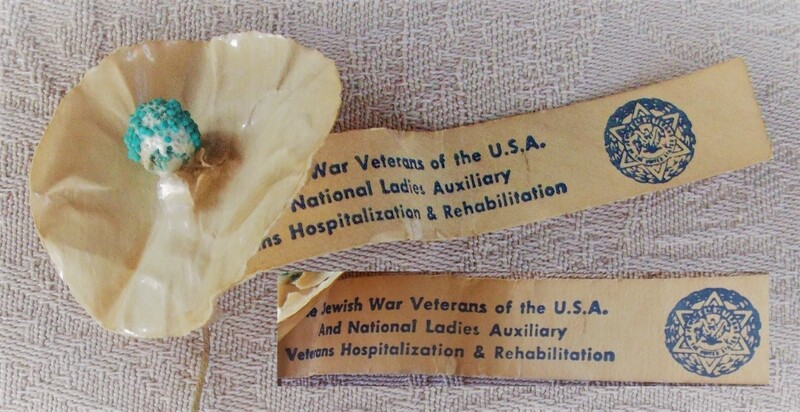 Above is a vintage white poppy, distributed by ‘The Jewish War Veterans of the U.S.A. and National Ladies Auxiliary’. Its age is not known – it has lost pureness of colour and some of its blue centre. 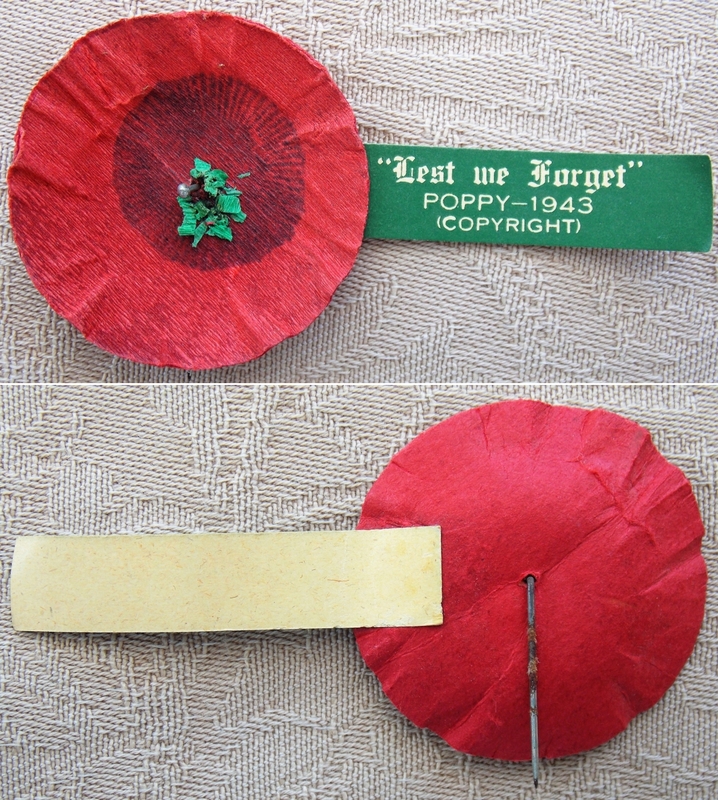 It is made of ‘painted’ card and identical in construction to the Veterans of Foreign Wars organisation’s ‘Buddy Poppy’ – only the colours separates them. It appears that the ‘Jewish War Veterans of the U.S.A.’ organisation is not connected to the ‘Veterans of Foreign Wars’. The Jewish veterans’ organisation was founded in 1896 by Jewish veterans of the American Civil War – it was called ‘The Hebrew Union Veterans Association’. The organisation changed its name a few times over the years but, in 1928, it finally became known as the ‘Jewish War Veterans’. The organisation is based on the same principals as the Veterans of Foreign Wars and the American Legion – to honour those who served and to raise funds for veterans. The wearing of a white poppy began on Armistice Day 1933, when members of the Women’s Co-operative Guild of Great Britain. British Legion officials were strongly opposed to it. 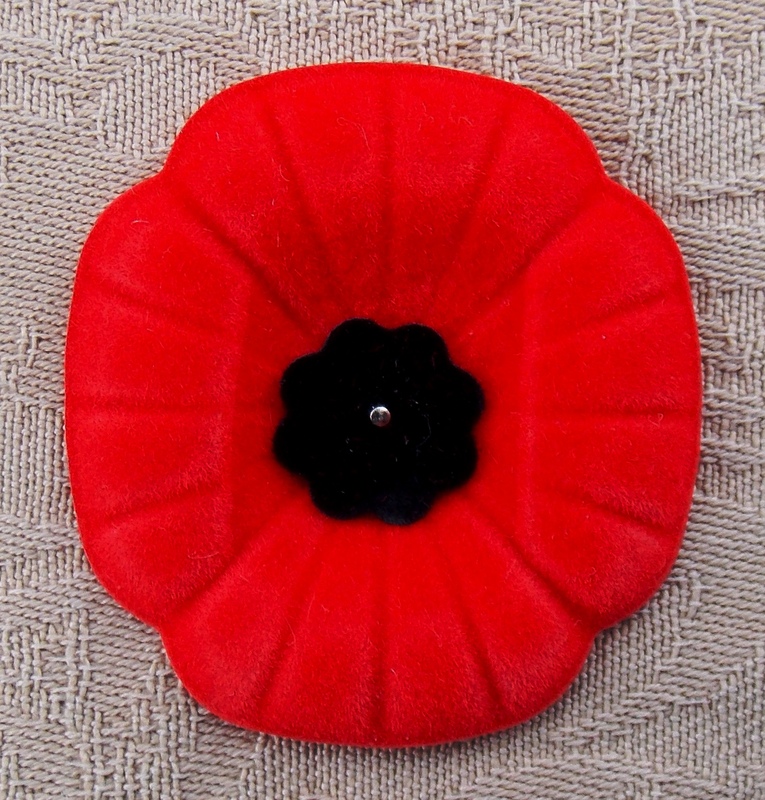 One Legion official said “… There is no need for a peace emblem in addition to our poppy. Not only does it stand as a memory of the sacrifice of millions, but of those who fought and still live to do all possible to prevent a future war. … This is an insult to the Flanders poppy and all it stands for. …” (Sheffield Independent, 30 October 1933). A little more information about the white poppy is included in the chapter: REMEMBRANCE POPPY TIMELINE FOR GREAT BRITAIN. Canada let Madame Anna Guérin down more simply than the USA. The 1922 Poppy Day commemoration was the last one Anna Guérin was involved in. Canada was saying “Au revoir Madame Guérin” too. 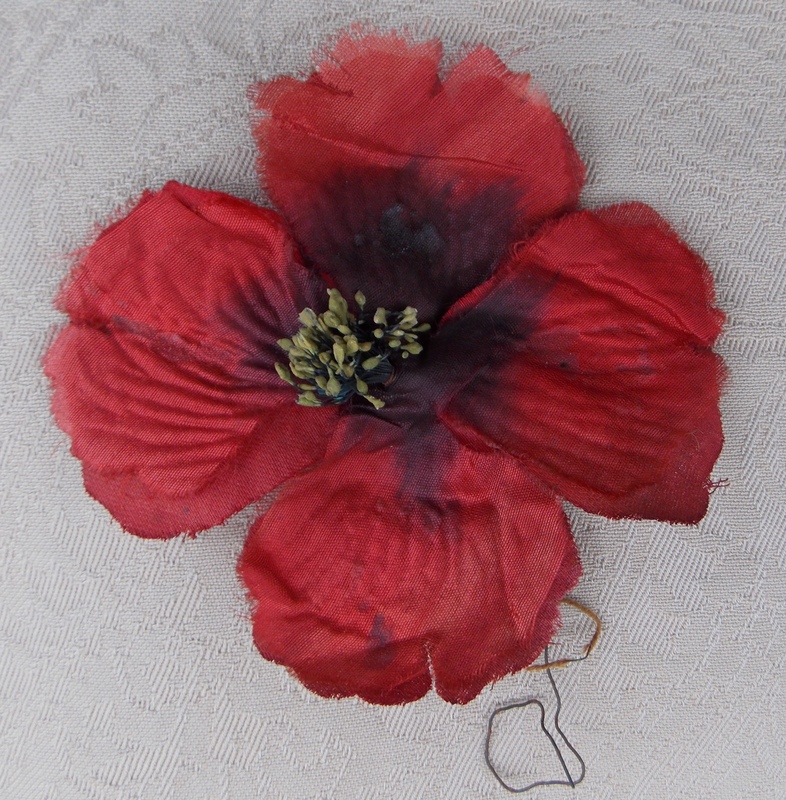 An early Remembrance Poppy from Canada: A large 1921 Guérin or early ‘Vetcraft’ poppy? Courtesy of Heather Anne Johnson. The next chapter in the Remembrance Poppy history, within Canada, involves one Captain [Brigidier] James Learmonth Melville M.C. but his name is rarely mentioned. As Madame Guérin was once known as the true “Originator of the Poppy Day”, Captain Melville M.C. was once known for his work connected with Canadian veterans and the poppy. After the end of World War One, Captain James Learmonth Melville, M.C. became the Principal of the Vocational School for Disabled Soldiers. On 31 May 1920, James married Clare Gladys King at Dominion Methodist Church, Ottawa. In 1921, James was appointed the Unit Director of Administration in the Department of Soldiers’ Re-Establishment. The post of Director of Orthopaedic and Vetcraft Services followed. “How a modest flower became a potent symbol. by J. A. Davidson. “… … a few days before Remembrance Day 1979, I visited Brigadier James L. Melville in the National Defence Medical Centre in Ottawa. “Jimmy,” as he was known to many old soldiers, particularly those who had served in the Royal Canadian Engineers, was then in his 92nd year. He was a member of the Ottawa church of which I was minister, Dominion-Chalmers United. That day we chatted about, among other things, the Poppy of Remembrance and his role in the development of it as a symbol: I had first heard about that a year earlier. Jimmy came to Canada from his native Scotland not long before the outbreak of the First World War. He served in the Canadian Army during that war and was awarded the Military Cross for gallantry at Vimy, and later a bar to it. During the Second World War he was on active service, finishing as a brigadier. Shortly after the First World War, Jimmy joined the federal Department of Civil Re-establishment. He was put in charge of what were called “sheltered workshops,” which had been set up to provide employment for disabled veterans. The Great War Veterans Association became an integral part of the Canadian Legion, which was established in 1925 – later to be known as the Royal Canadian Legion. Jimmy Melville, a gracious and gentle man, claimed no special credit for the poppy program in Canada. “It was Madame Guerin who started it all,” he said. “I just picked up on a good idea.” Yes, and he ran with it. Jimmy Melville lost a brother in the First World War and a son in the Second. I officiated at his funeral in 1980. During the Service, I read In Flanders Fields. On 9 November 1922, The Gazette (of Montreal) wrote [sic]: “POPPY SUPPLIES GOING OUT TODAY. Depot at 363 St. Catherine West Will be Busy Scene. The poppies which are to be sold in the streets on Saturday in the National Poppy Day Campaign are being distributed today to the forty or more districts into which the city has been divided. At the central depot, the Bank of Hochelaga branch at 363 St. Catherine street west, 100,000 small and 75,000 large poppies have been apportioned to the districts and placed in boxes for convenient handling. The captains of districts have been instructed to call at the central depot this afternoon, between one and six o’clock, to sign receipts for their allotments of poppies and boxes. The ladies in charge of the depot will work through until all the poppies have been sent to the various district headquarters throughout the city, the nearest branches of the Bank of Hochelaga being utilized wherever possible. For this distribution a number of motor cars have been generously provided by owners in sympathy with the purposes of Poppy Day. 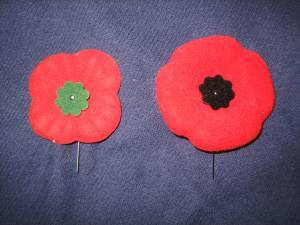 It is reported that, in 1923, Lillian Bilsky Freiman’s Vetcraft Shops took over the entire poppy making for Canada. Lillian became a member of the National Poppy Advisory Committee and chaired Ottawa’s annual poppy campaign nearly every year until her death. “POPPIES MADE AT ONE SOURCE. In a statement issued by the Great War veterans’ association, attention is called to the coming sale of poppies on Armistice Day. The association points out that there is only one source of manufacture from which poppies can be secured that will give full effect to the purposed for which Poppy Day was instituted and that is the Vetcraft Shops, where the flowers are made by disabled veterans. The Dominion command of the G.W.V.A. has the sole authority for the distribution of Artcraft poppies. It may be well, the statement points out, to remind ex-service men and women and the public generally of the three great objects attained by the distribution of poppies on Armistice Day. First the wearing, of a poppy emblematic of Flanders Fields, provides an appropriate means of demonstrating that the great sacrifice of Canadian manhood and womanhood during the Great War is not readily forgotten. Second, it provides a means of re-establishment for seriously disabled men whose disabilities prevent them from engaging in any work other than poppy manufacture. Third, it creates funds for the assistance of disabled and otherwise handicapped ex-service man, as well as the dependents of the fallen. This ensures that every cent derived from the sale of poppies on Armistice Day is retained in Canada and devoted to bettering the conditions of disabled soldiers and dependents. Commercial manufacture and distribution means a large proportion of the proceeds go to private profit and possibly to foreign countries. In June 1925, Canada hosted a conference of the ‘British Empire Services League’ in Ottawa where it was decided that the poppy would be adopted as the Empire’s universal emblem of remembrance. The ‘British Empire Services League’ is now known by the title of the ‘Royal Commonwealth Ex-Services League’. Canadian “Currie Button” Remembrance Poppy 1934/35. Image courtesy/© of K. Furey. The above is a Canadian “Currie Button” Remembrance Poppy dating from 1934 or 1935, commemorating Ontario-born General Sir Arthur William Currie G.C.M.G., K.C.B. Currie had been an officer in the Canadian Army during the First World War. It dates to Armistice Day 1934 or 1935 – the first and second Remembrance Days in Canada after Arthur died (30 November 1933). 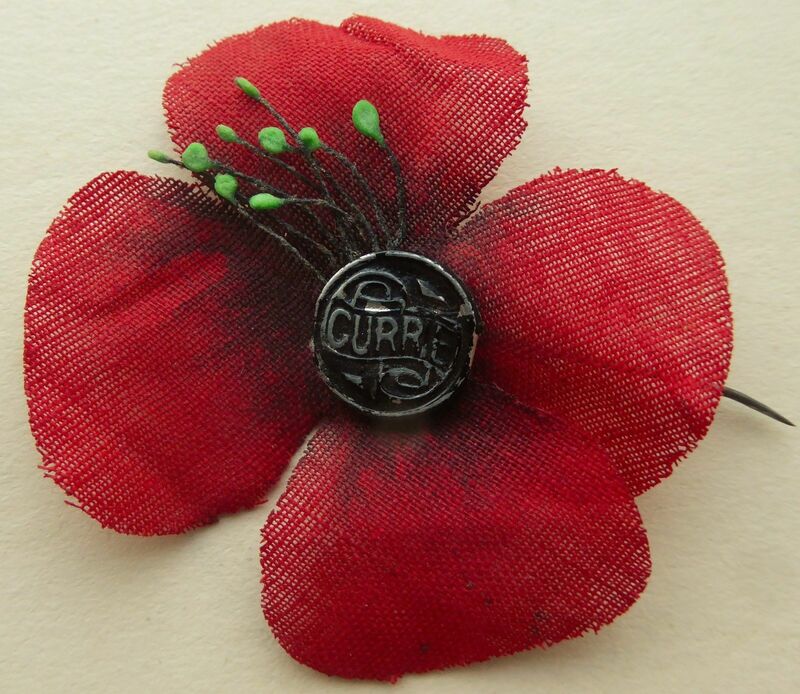 “Currie Button To Be Featured on Small Poppy. Veterans Plan to Honor Sir Arthur’s Memory and Stop Cheap Foreign Imports. As a tribute to General Sir Arthur Currie, later Grand President of the Canadian Legion and to further perpetuate his memory, the Canadian Legion in session to-day unanimously decided to change the design of the small poppy and replace it with a Currie Button. It was pointed out that Lady Currie had already consented to the carrying out of the tribute. The tribute to the late Canadian, was first suggested by Lieut. Col. L. R. La-Fleche, D.S.O., A.D.C, and his report formed the basis of a number of changes adopted with regard to making the poppies and poppy wreaths more attractive. These were embodied in report presented by E. Ralph Adye, Whitby, Ontario, who urged all members of the Legion to have as their yearly objective the sale of 5,000.000 poppies. He claimed that in the United Kingdom, with population of 45,000,000, a total of 43,000,000 poppies were sold. Wreaths should be made more attractive and the practice of depositing other than Vetcraft wreaths at official memorial services discouraged, the convention agreed. 2) a plainer one, without stamens; with a central paper ‘button’, rather than the metal embossed one shown above. The paper centre depicted the head/shoulders image of General Currie, along with the words “CURRIE” above “REMEMBRANCE DAY”. 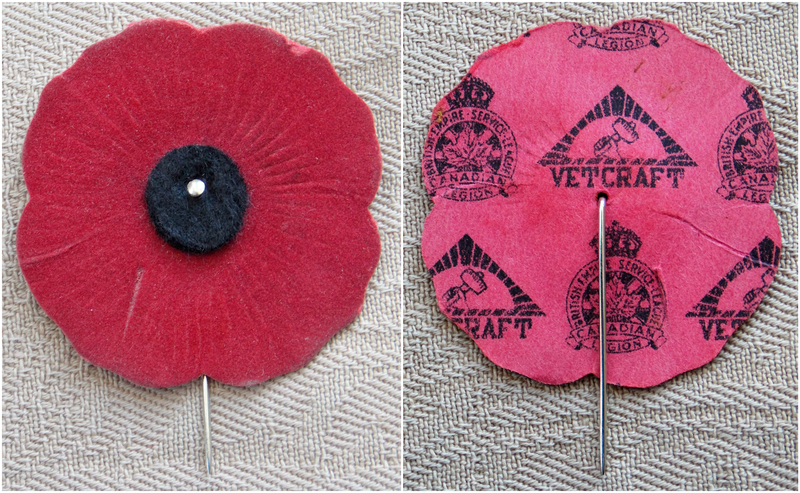 A Canadian ‘Vetcraft’ Remembrance Poppy pin: 1927-51. Courtesy of Heather Anne Johnson. The rear of the poppy shown above bears the ‘VETCRAFT’ trademark, together with the emblem of the ‘Canadian Legion of the British Empire Service League’. It is deduced that this particular style of poppy dates to no earlier than 1927 and no later than 1951 – any enlightenment regarding a more precise date is welcome. The latter organisation came into being in 1925, in Winnipeg. A special Charter and Act of Parliament were issued in July 1926, which was when the new emblem was introduced. The Canadian Legion and ‘Vetcraft’ collaboration began in 1927. The emblem bears the Tudor Crown (imperial and state crown of England and Great Britain), which was last used by King George VI – the last Poppy Appeal before his death would have been 1951. Royal Canadian Legion ‘Cinderella’ stamp, c1956. Royal Canadian Legion Remembrance Poppies. Courtesy/© of Paul Cipywnyk. Royal Canadian Legion Poppy Pin : Descendant of Madame Guérin’s Poppy. Courtesy/© of Heather Anne Johnson. Once the order for French-made poppies was made in September 1921, the British Legion said “Goodbye” to Madame Anna Guérin – business was concluded. Had there been enough time to manufacture British-made poppies instead, that farewell would have happened much earlier. From that point onwards, the poppies that have been distributed within Great Britain have been made by British veterans, under the auspices of the Royal British Legion. When the idea of Poppy Day was first suggested to the British Legion in 1921 by Mme Guerin of Paris, there were only six weeks in which to organise the scheme throughout the country. The Legion purchased the small “poppies” for 3d. in France, where they were manufactured by the women and children in the devastated areas. These poppies cost £15, 510. The first orders for the 1s. poppies were given to London manufacturers, but the demand was so great that it was impossible to get enough to London, and they had to send to France, Coventry and many parts of the country, and were even then unable to meet all demands. The success of the 1921 Poppy Day far exceeded anticipations, realising £105, 842. 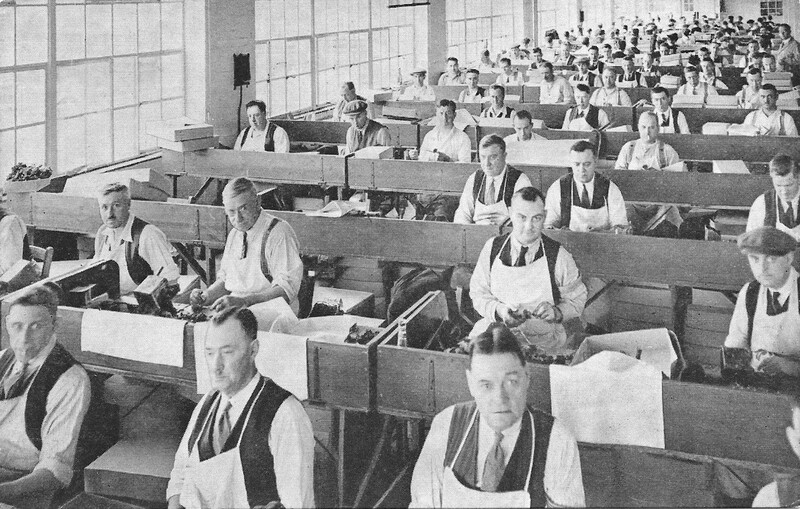 It was decided that the 1922 scheme should be for the sole benefit of British ex-Service men; the Disabled Society, under the management of Major Howson, undertook to manufacture poppies and for this purpose took the factory at St. James’-road, commencing with a staff of about twenty badly disabled ex-Service men. They manufactured 5,000,000 poppies last year, and the balance was suppplied by manufacturers. Most of the employees have lost a leg. The factory is now working full time, and by the middle of September upwards of 14,000,000 small poppies and 250,000 large size, and 300 wreaths will have been manufactured. The men have a canteen on the premises, thus not having to go out for meals; a friend has given a piano, and they are a very happy company. It is very difficult for the society to keep its prices low as that at which the poppies could be purchased in the open market, for although paying the full Trade Union rate of wage, 1s. 2d. an hour, they are at the same time competing with women and child labour, which is very much cheaper. Besides manufacturing 180,000 cornflowers for the Ypres League for Ypres Day, the factory has executed other order for similar institutions, and the work only requires to be more widely known to be used for still more orders of a similar nature. Poppies this year will cost the British Legion barely ½p. each, but should the output in the future be greater the cost will be correspondingly lower. Many parts of the Empire have been supplied, including Gibraltar, Malta, British Army in the East, India, and South Africa, and it is hoped that by the universal adoption of Poppy Day throughout the Empire all poppies will eventually be supplied from the British Legion Disabled Factory. The factory has now been taken over by the British Legion, but although controlled by that organisation it is still managed and worked by the Disabled Society. In March 1926, the Lady Haig Poppy Factory was opened in Edinburgh. When Lady Haig visited Dundee in the November of that year, the Dundee Evening Telegraph (03.11.1926) noted that there was “Great difficulty was experienced in getting collectors” and Lady Haig “appealed for more workers”. It appears that it became the custom, for both Great Britain and the United States of America, to send some of their respective Remembrance Poppies to be sold in France. With regard to the Great Britain, British poppies were sold on Armistice Day, 11 November. “YELLOW POPPIES IN FRANCE. LEGION EFFORT TO AVOID POLITICAL CLASH. In France political differences were forgotten in a joint tribute of remembrance. Both the Front Populaire and the French People’s Party postponed meetings due to-day in order to avoid a possible clash. But it has been thought tactful for the British Legion in Paris this year to substitute a yellow poppy for the red one, now the red variety has been adopted as a badge by the Communists. The change was made at the urgent request of Legion branches in the South of France, where political feeling is running higher than in the north. The Red poppy was retained for the wreath placed below the tablet in Notre Dame commemorating the British Empire’s million dead. For the first time children took part in the ceremony at the Arc de Triomphe, filing past the President of the Republic in the same way as troops of the Paris garrison. Even more moving than the ceremonies in Paris were the battlefield commemorations. All through the night watch was kept at Notre Dame de Lorette, the chapel dominating the great Flanders cemetery where thousands of French, British, and Germans lie buried side by side. Torches lit at the graves of the Unknown Soldiers in Paris and Brussels were borne from one capital to the other across the battlefields. The two symbolic flames, borne by ex-soldiers, crossed at Cambrai. Just before the Silence, King Leopold “decorated” Belgium’s Unknown Soldier with the Croix de Feu. The medal was pinned by the King on a cushion held by a soldier. The cushion was then laid on the Unknown Soldier’s tomb, while trumpeters sounded a salute. The Dominions and Colonies shared with Britain in thoughts of those who laid down their lives in the Great War. The principal ceremony in India was held at Delhi, where 1,200 ex-Service officers and men, British and Indian, marched past the Viceroy, Lord Linlithgow, at the Memorial Arch. 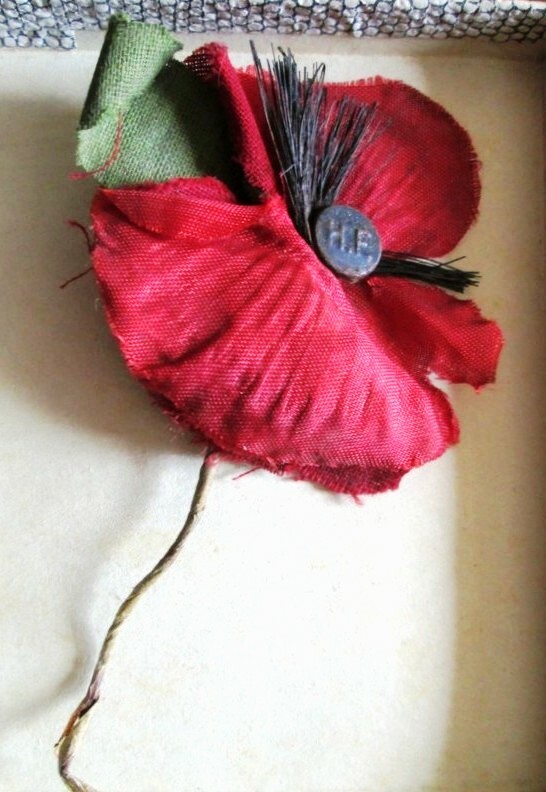 A British Haig’s Fund Poppy : “HF” c1930-38 : Courtesy/© of Edward Peacock. In the later summer of 1921, Colonel Crosfield asked me it I would meet a Madame Guerin. This little French lady came to Headquarters to show us some small artificial poppies of a type then being made by certain French-women and sold for the benefit of the children in the devastated areas of France. Would the British Legion care to adopt this emblem as a means of raising money for its own purposes? There were two firms in France who were ready to supply the material, etc. She would want a certain percentage for her own organisation in France. The Finance Committee of the National Executive Council, was concerned with the raising of funds, which were sorely needed if benevolent work on, and reasonable scale was to be undertaken. The project was put to them. Poppies! Who wants poppies? Madame Guerin, who is she? What are her credentials? Do the two French firms exist? It was August. The sale and collection, if it was to be made, was due for November 11th. There was no time to make suitable arrangements on this side of the Channel. If we were to do anything with the idea we must use the French organisation. But did anybody want poppies—why poppies? The Legion had taken over, as part of the amalgamation arrangements, the Appeals Department of the Officers’ Association, of which Sir Herbert Brown was the head. He was sent for, consulted and asked to go over to Paris. We shall always be grateful to that good lady, Madame Guerin, for her part in the scheme). He reported to the next meeting of the Finance Committee that all appeared to be in order, The firms did exist; they were ready to supply the material to the organisation for making the poppies; the women in the devastated areas of France would make them. What he finally did I know not but I do know that a very large number (for those days) of poppies were sold on that November 11th; also, that not a vestige of pink blotting paper remained in the neighbourhood of Eccleston Square! By whatever means it was done, that first Poppy Day of 1921, under a scheme rushed through between August and November, achieved a total of £106,000. The total to date is nine millions. Originating in France, the poppy-making industry was transplanted to England in 1922. The late Major Geo. Howson, chairman of the Disabled Society, founded the poppy factory in that year with a grant from the Unity Relief Fund, later the Legion Relief Committee. The chairman of that fund was Major Paget Hett, who, on Major Howson’s death in November, 1935, succeeded him as chairman of the Poppy Factory, a position he holds today. The first home of the factory was a workroom placed at its disposal by a collar manufacturer, a Mr. Mitchell, in St. Jame’s-road, Bermondsey, off the Old Kent Road. A start was made with only five employees. Four of them are still making poppies and one is factory foreman. By 1923, when Mr. C. Howe, present secretary-manager, joined the staff, the employees numbered 50; and in March, 1926, when Earl Haig handed over the deeds of the present factory at Richmond, there were 150 workers, all disabled in the Great War. From the beginning Major Howson had no intention of relying on sweated labour in slum attics for the supply of Legion poppies. In 1929 additional premises were acquired; in 1932 the Princess Royal opened the main factory; and in 1936 further premises for extension were taken. Major Howson made the Richmond factory spacious and well ventilated, a show-place which has been visited and admired by thousands all over the world. The scope of the factory’s work was widened to include the manufacture of metal “Haig Fund” centres, cardboard centres, boxes and other component parts of the poppy. The normal full complement of employees is 400 but, at present only 350 are regularly at work, including five men of this war. All are war-disabled. More than half are limbless. The total number of poppies made since the factory was begun is 497 millions; the total of wreaths 500,000. The net certified annual profits are transferred to the British Legion Benevolent Fund to be set against the gross cost of poppies. Up to the end of the last financial year (November, 1941), wages paid from the beginning of the factory amounted to £1,086,030. The value to the factory of sales of poppies in the same period was £2,240,000. Life after Poppy Lady Madame Guérin : 1942 British Haig’s Fund “Austerity” Poppies. Courtesy/© of Heather Anne Johnson. 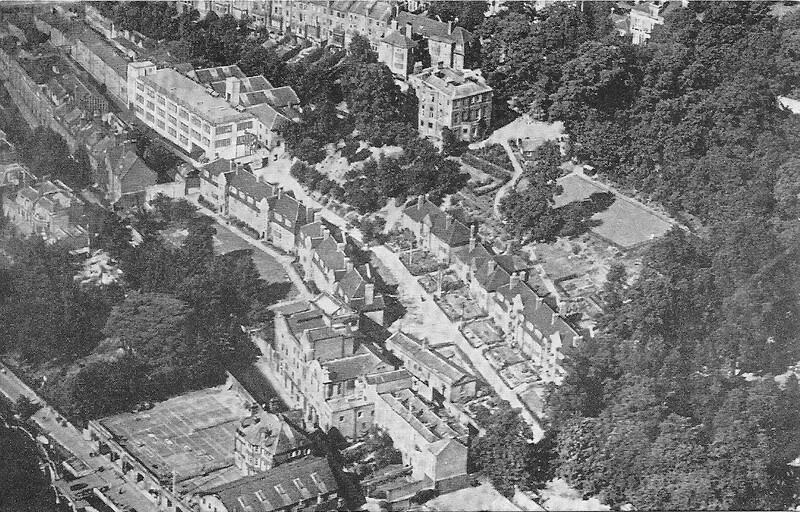 An aerial view of the Poppy Factory and Housing Estate in Richmond, Surrey (c1932). Courtesy of Heather Anne Johnson. 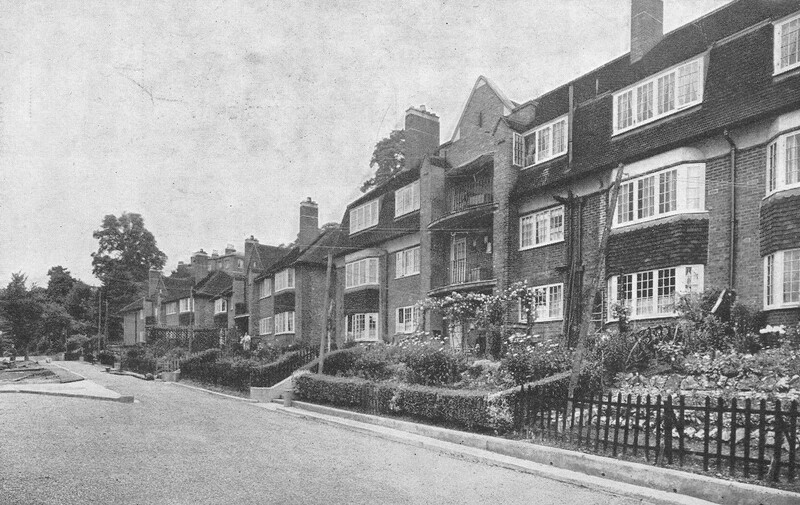 Accommodation blocks at the Poppy Factory’s Housing Estate in Richmond, Surrey. Courtesy of Heather Anne Johnson. Internal scene, assembling individual poppies : Poppy Factory in Richmond, Surrey. Courtesy of Heather Anne Johnson. 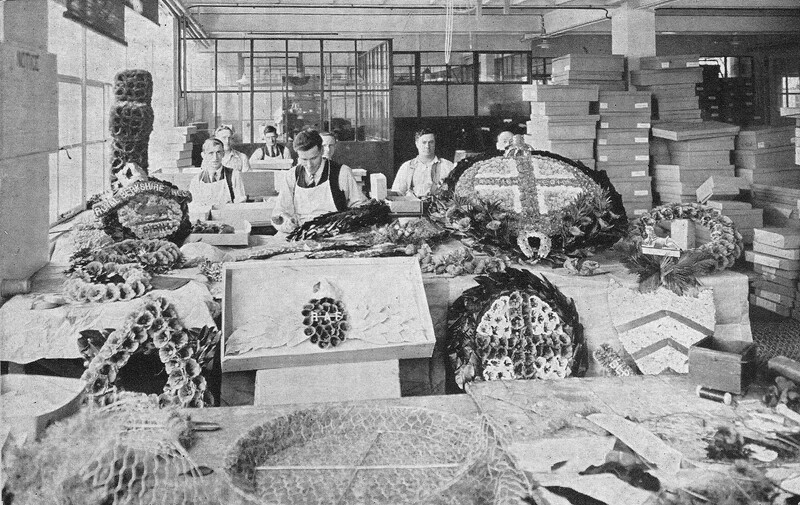 Internal scene, making wreaths : Poppy Factory in Richmond, Surrey (Date unknown). Courtesy of Heather Anne Johnson. The photograph above was discovered by Mélanie Presseau Dumais of the Musée du Royal Montreal Regiment (The Royal Montreal Regiment Museum) in Montreal, Canada. By mutual arrangement, Mélanie symbolically colourised the image, as shown below. 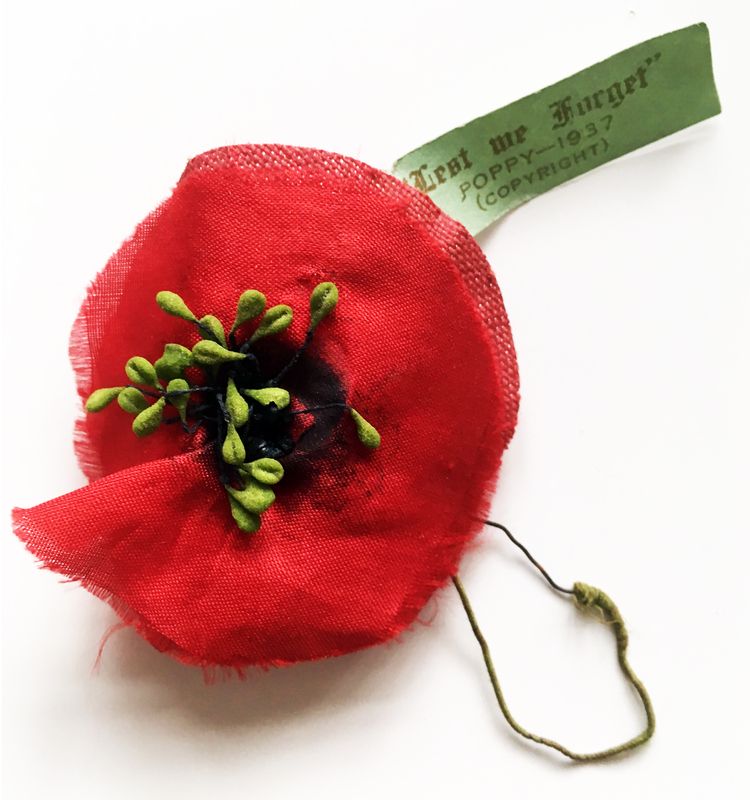 It was used to market an interesting event, held recently at the Musée du Royal Montreal Regiment – it was a successful poppy making workshop, which was attended by 200 people. Courtesy of Musée du Royal Montreal Regiment & Heather A. Johnson. English Royal British Legion Poppy : Modern. 2 petals + 1 leaf. Image courtesy/© Heather Anne Johnson. ‘Poppies Wave’ by artist Paul Cummins and designer Tom Piper at Lincoln Castle, Lincolnshire, England. Image courtesy/© Heather Anne Johnson. See the chapter ‘REMEMBRANCE POPPY TIMELINE FOR GREAT BRITAIN’. Australia kept faith with Madame Anna Guérin for longer than the aforementioned Allies and the country continued to be loyal to French-made poppies until 1926, inclusive. Anna never visited Australia but she kept up communication with the veterans of Australia’s Returned Sailor’s & Soldier’s Imperial League. She would have wanted to show appreciation and give thanks but it was also imperative to keep the momentum going. However, eventually, the Australian veterans were given top priority. “Poppy Day Appeal. The president of the Returned Sailors and Soldiers Imperial League has received a letter from Madame Guerin, organiser of the French Children’s League in which she conveys the thanks of that league for the assistance received through the sale of poppies last year. “Until recently,” she wrote, “I thought it would be possible for me to come to Australia this year and to assist you in the success of your second Poppy Day. It is with many regrets that I have been compelled to postpone this pleasure. I know that your people and your organisation would have welcomed the news that I should have brought from those flanders fields which your gallant soldiers so nobly saved. It would have been a great joy to me to have the privilege of speaking in your schools and to the returned soldiers of Australia, but it is necessary for me to go to other European allied nations, lest they should forget that they must have in memoriam their Poppy Day on the anniversary of armistice. I have pleasure in advising you that, as a result of requests received from so many mothers and dependents in Canada, United States and England committees have been formed in all towns, villages. etc., for the purpose of assisting those dependents to have wreaths of poppies placed on the graves of their brave relatives. In connection with this scheme it is suggested that the returned soldiers’ organisations throughout the allied countries should make an appeal to the parents of deceased soldiers buried in France to subscribe to the cost of a wreath of poppies, which would be placed by local committees in accordance with their desire. A certificate, by the Mayor of the town or village near by the cemetery, would be sent to each relative subscribing for a wreath, certifying that same had been placed on the grave. Our idea is that all such wreaths should be placed on the graves during the week of Easter. 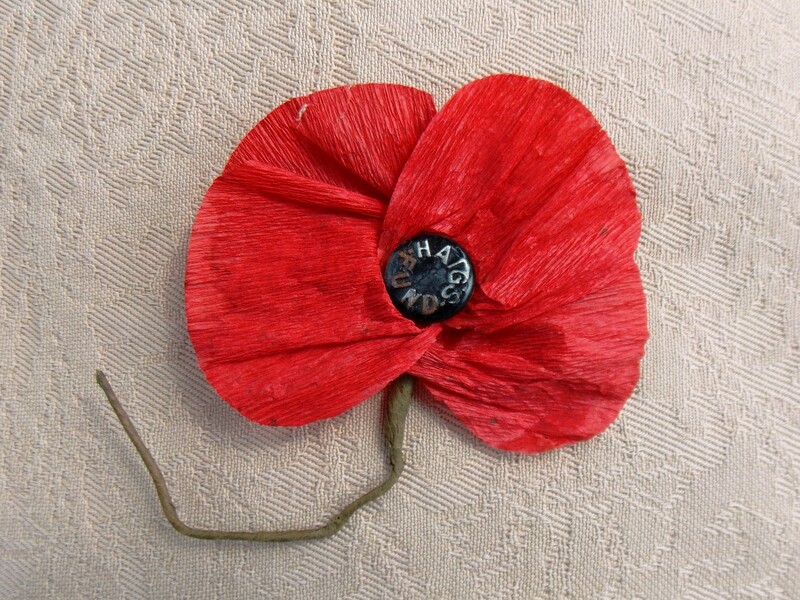 The poppies are made of waterproof material so that the wreaths shall last a long while. In 1924, an article in the Warwick Daily News (Queensland. 06 Nov.) highlighted the fact that not every town in Australia was participating in Poppy Appeals: “Poppy Appeal in Warwick. In the year 1921, a French lady, Madame Guerin, conceived the happy idea of despatching to Australia thousands of poppies for sale, the proceeds to be devoted to giving attention to the graves of Australian soldiers in France. Since then the appeal has been continued, and on Saturday, Monday and Tuesday, next it will be made in Warwick for the first time. The matter has been enthusiastically taken up by the Warwick branch of the R.S.S.I.L.A., principally through its ladies’ committee, while the assistance of the Women’s Club and of the Country Women’s Association has also been procured. Already 200 French poppies have been received. It is notified in this issue that ladies willing to assist in selling poppies, in conjunction with the organ-isations above mentioned, are invited to attend a meeting at the R.S.S.I.L.A. rooms on Friday next at 2.30 p.m. This appeal has a peculiar significance to all in whom memory of the great war has not been overlaid with other matters of daily concern, and we trust the appeal will meet with the success that it certainly deserves. “POPPY DAY. For R.S.L. Funds. Poppies will be sold for the benefit of R.S.L. Amelioration Funds next Thursday by parties of ladies acting for metropolitan sub-branches of the R.S.L. Many country centres have also applied to the League headquarters for poppies for disposal in aid of country sub-branch purposes. It is expected that all citizens will show their appreciation of the sacrifices made by Australian soldiers in the great war and wear a poppy in remembrance. The ladies of the West Perth sub-branch R.S.L. will have the assistance of Miss Maud Fane, of the J. C. Williamson Opera Company, and as the poppies were obtained from Madame Guerin, in France, a proportion of sales will benefit French war orphans. Finally, Australia had said “Au revoir Madame Guérin”. 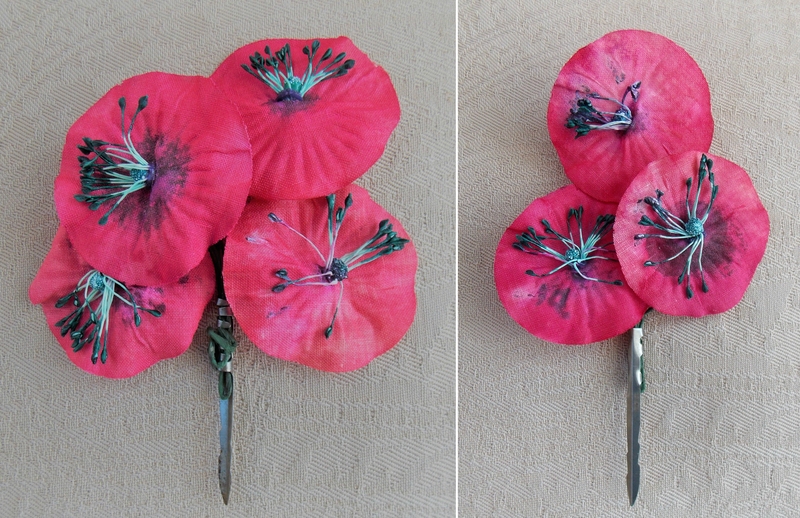 Australian Remembrance Poppy Corsages. Courtesy of Heather Anne Johnson. 1937 Australian Remembrance Poppy. Courtesy/© of Peter Doyle. 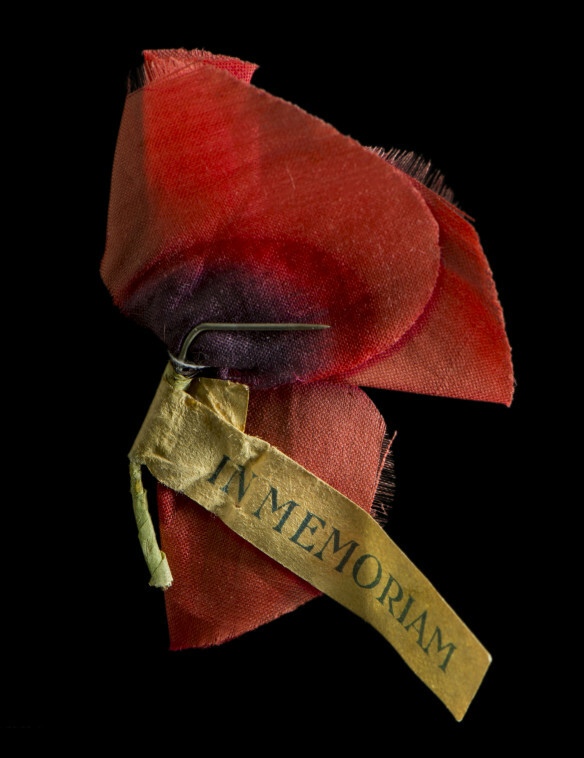 An Australian 1943 paper Remembrance Poppy. 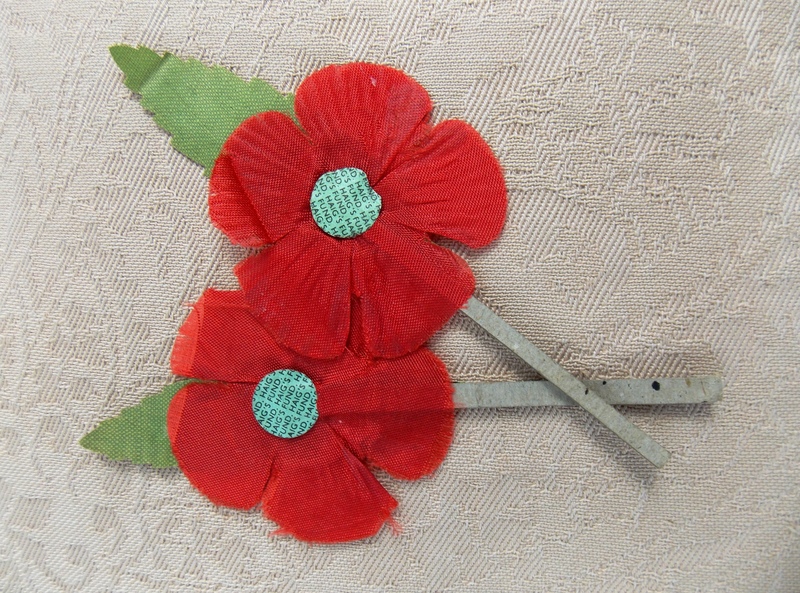 Australian WW2 Remembrance Poppy pin – flocked card. Courtesy/© of Heather Anne Johnson. Australian R.S.L. ‘Lest We Forget’ badges. Circa late 1940’s. Australian R.S.L. Poppies. 1960s. Courtesy/© of Heather Anne Johnson. Australian Remembrance Poppies. Courtesy/© of Heather Anne Johnson. Australian R.S.L. Poppy Appeal tag and pin. 2016. Courtesy/© of Heather Anne Johnson. N.B. Australians also wear sprigs of rosemary on Anzac and Armistice Days. The herb grows wild on Gallipoli, a peninsula with poignant First World War memories for Australians. Like Australia, New Zealand remained loyal to Madame Anna Guérin. In actual fact, New Zealand was the most loyal of all the WW1 Allied nations. Like Australia, the country was never graced with Anna’s presence but she kept in touch with the veterans of the Returned and Services’ Association by letter. From a New Zealand gentleman’s recollection, many New Zealand women remained “representatives” of Madame Guérin for years. Poppy Day for 1923 is now a thing of the past, but the N.Z.R.S.A. cannot allow the event to pass by without thanking the ladies throughout New Zealand for the great part they have again displayed in making the day a success. The results of course are not available, but Auckland’s total is in the vicinity of £1600; the ladies of Wellington netted about £1000 whilst Christchurch raised £853. So great was the demand for poppies in the last place that the supply had been sold shortly after mid-day. The day has evidently been another success; it is difficult to see how it could be otherwise, when the objects to which the money is devoted are reflected upon by the public. The history of the Great War as far as it effected New Zealand can never be complete without some acknowledgement of the noble services performed by our New Zealand women. In spite of rain and snow, and in spite of refusal or black looks, our ladies have never deserted the cause of our soldier boys; the same street corners saw the same collectors doing the same noble work many times a year. Zealandia’s ex-soldiers will never forget the practical patriotism and kindness meted out by our women-folk. About £9500 was gathered last year to help in procuring work; this was supplemented by subsidies granted by local bodies. On 21 November 1923, Christchurch’s ‘Press’ newspaper reported that the Canterbury District Executive had received a French flag from Madame Guérin “Poppy Lady” of France, for presentation to the Returned Services’ Association selling the most poppies prior to Anzac Day. The District Executive had decided that this flag should be presented to the Christchurch R.S.A. In 1925, the ‘Press’ (21 April) printed: “POPPY DAY. ASSISTANCE FOR UNEMPLOYED SOLDIERS. Arrangements for Poppy Day, to be observed to-morrow, have been completed, and as a large number of ladies have undertaken to assist in the sale of poppies in aid of the Returned Soldiers’ Association’s Unemployment Fund it is fully anticipated that the results this year will eclipse those of last year. 1929 was the first year that New Zealand’s poppies were not made by the widows and orphans of the devastated areas of France: “… Last year £1400 was realised from this source. Ever since the war the poppies have been supplied by France, but this year a departure has been made, and they are being purchased from the British Legion of Disabled Soldiers, in London. Thus, by buying them next month, citizens will have the added satisfaction of assisting Imperial soldiers as well as soldiers in their own country. Auckland Star (12 March). This is the slogan used by the Christchurch Returned Soldiers’ Association and it is hoped that on April 24th—the day before Anzac Day—every man, woman, and child will spend shilling on a poppy, and thus be instrumental in finding employment for returned soldiers who are in distress. Cases containing 30,000 poppies arrived at the R.S.A. rooms yesterday morning from the poppy factory in Surrey, England, and on April 24th they will be sold throughout the City, suburbs, and country districts. The Association is making a particularly strong appeal this year, and large numbers of people have banded themselves into committees to attend to the distribution of the tokens. People often ask, “How did Poppy Day start?” In 1921 a woman, having lost her son at the war, and who was visiting the battlefields of France, noticed large numbers of peasants manufacturing artificial poppies and selling them to tourists. She was struck with the idea that the poppies could be manufactured in England, to the great benefit of disabled soldiers, who could be assisted by the proceeds of sales organised on a large scale. Putting her thoughts into action she placed the scheme before the British Empire Service League, in London, and the League fell in immediately with her negotiations. Later a poppy factory was started in Surrey, England, and now 275 disabled soldiers are employed there, manufacturing the emblems and supplying them to the whole of the British Empire. In 1921 £100,000 worth of poppies were sold on Armistice Day. To you from falling hands we throw, The torch; be yours to hold it high. If ye break with us who die, We shall not sleep, though poppies grow In Flanders Field. Miss Michael wrote an answer in verse, which ended thus: And now the torch and poppy red. We’ll wear in honour of our dead. Tear not that you have died for naught; We’ll teach the lessons that you wrought In Flanders Field. Through the Y.M.C.A., with which she was connected, Miss Michael promulgated her plan that poppies should be worn for remembrance. She wrote to the War Department, educational institutions, women’s clubs, and other organisations, urging adoption of the poppy as a memorial tribute. The American Legion of Georgia agreed. The idea spread to other lands. Mme. 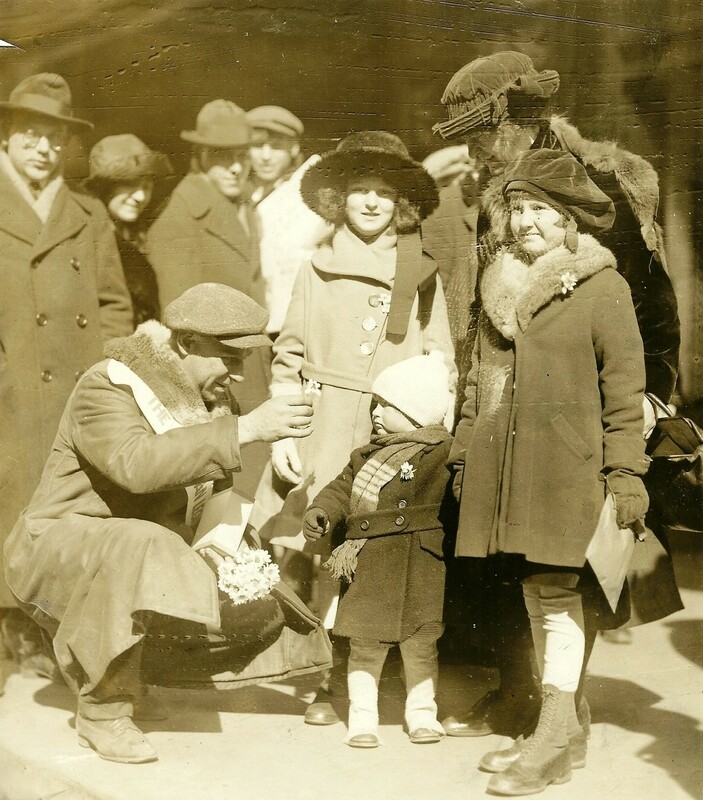 Guerin, of Paris, organised, the American and French Children’s League and sold poppies for the benefit of orphans in France. In England the poppy programme was adopted in 1921 by Earl Haig’s British Legion, and since that time more than £2,000,000 has been collected for ex-service men. In 1925, the British sales reached £600,000. Instead of the poppy becoming a national emblem, it became international. In Europe, nineteen countries wear it. Poppies are worn in Japan, China, and Mexico. Over £180,000 was raised in the 1928 sales in United States; 39 hospitals and workshops were used to make them, employing 2348 persons. 1931 was the first year that disabled veterans in New Zealand made the poppies that were distributed on the streets of New Zealand. Although the women who had been New Zealand’s original “poppy girls” and the Returned Soldiers’ Association veterans who had met Colonel Moffat knew the truth, it was the beginning of New Zealand forgetting about Madame Guérin and her Remembrance Poppy Day idea. New Zealand had said “Au revoir Madame Guérin”. 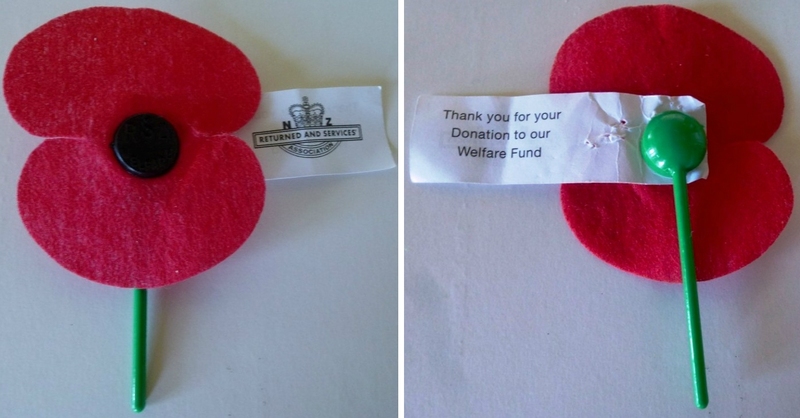 Cloth Poppy, Royal New Zealand Returned and Services’ Association (estab. 1916), gifted by Ruth and Olive Ellison, Collection of Hawke’s Bay Museums Trust, Ruawharo Tā-ū-rangi, m54/22. Courtesy/© of the Hawke’s Bay Museums Trust. New Zealand ‘Returned and Services Association’ Remembrance Poppy. 2016. Image courtesy/© of A. 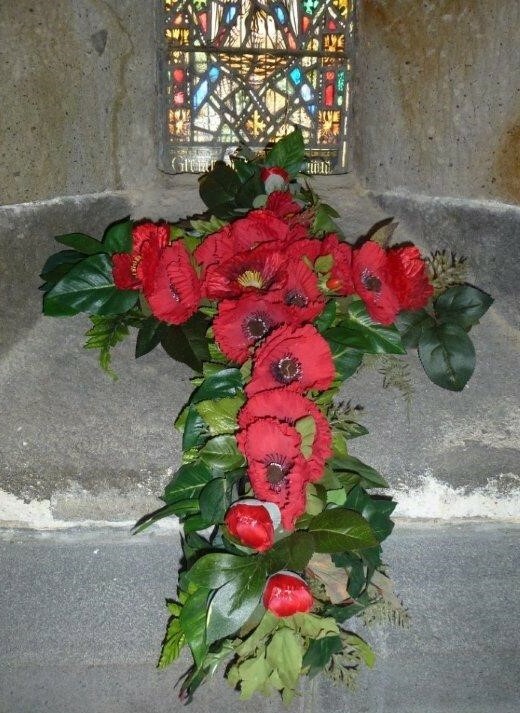 & P. H.
Cross of poppies made by the Flower Guild, placed near the Memorial to the Fallen at Cathedral Church of St. Mary, New Plymouth. 2016. Image courtesy/© of A. & P. H.
To date, it is not known when Anna Guérin would have visited Belgium or Italy and little is known about just how long France, Belgium and Italy (during the 1920’s era) wore the poppy as a remembrance emblem.